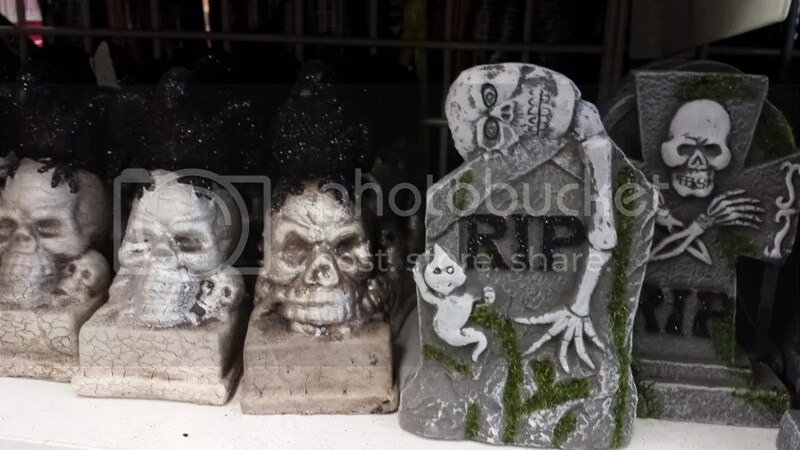 Whew Halloween is over…. Wait that means its only 55 days till Christmas! 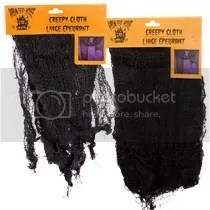 My daughter has this furry black hat with red devil horns on it. This year she decided she wanted to be a devil girl for Halloween. 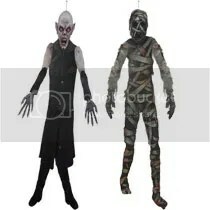 We love making our own costumes… they are much nicer than most store bought. I remember a few of my old costumes from when I was a kid… There was the witch… it was by far my favorite! The only thing I had store bought for that was the hat and the broom. 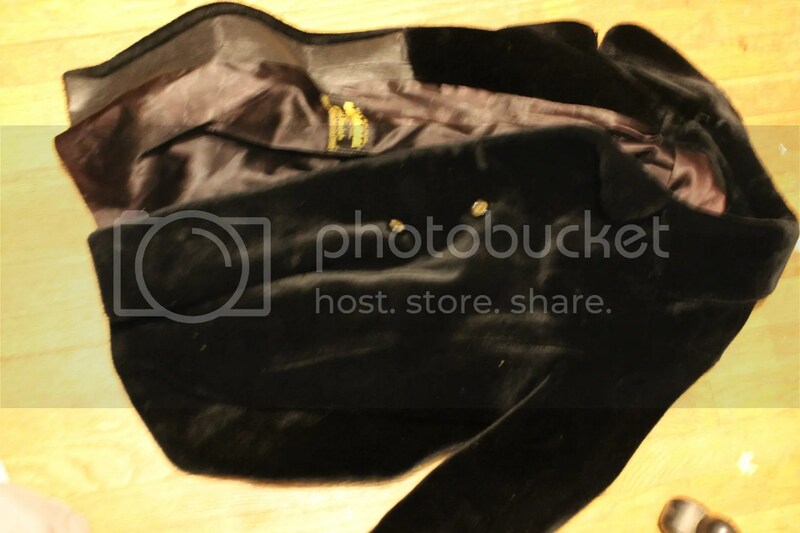 We had found a long black skirt turtle neck and this awesome black cape! it was satin with silver stars on the trim all the way around the cape. My mom had these really cool vintage owl necklaces which added that last touch I needed to make it perfect! When I got older I had put together a punk rock costume out of 80’s clothes I found at a thrift shop. Now I love making costumes. My fave is a couple years ago my husband and I were alice and the hatter from Tim Burton’s Alice in Wonderland. Alice in the Um Dress and the Mad Hatter. I created my costume from scratch. 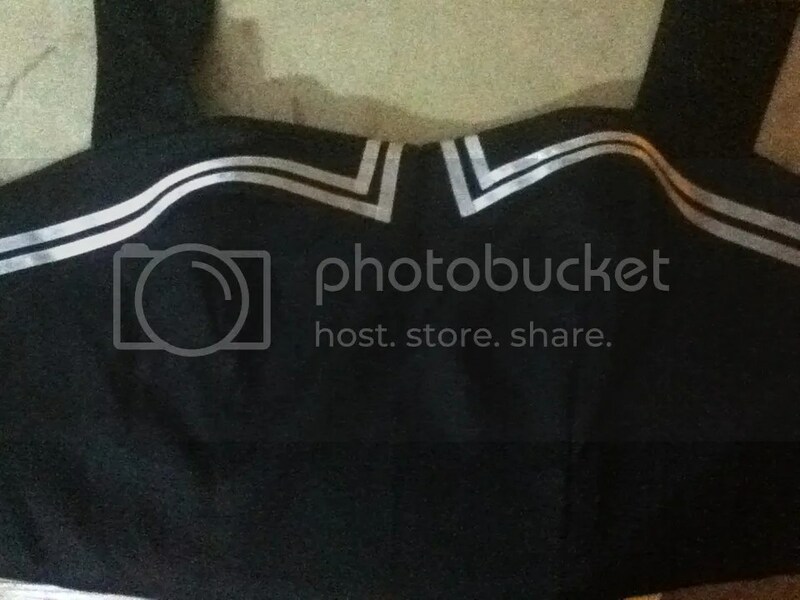 I had to order the white material and I painstakingly added the black stripes and hearts to it. My husbands costume was a mix between homemade repurposed and altered thrift store finds. 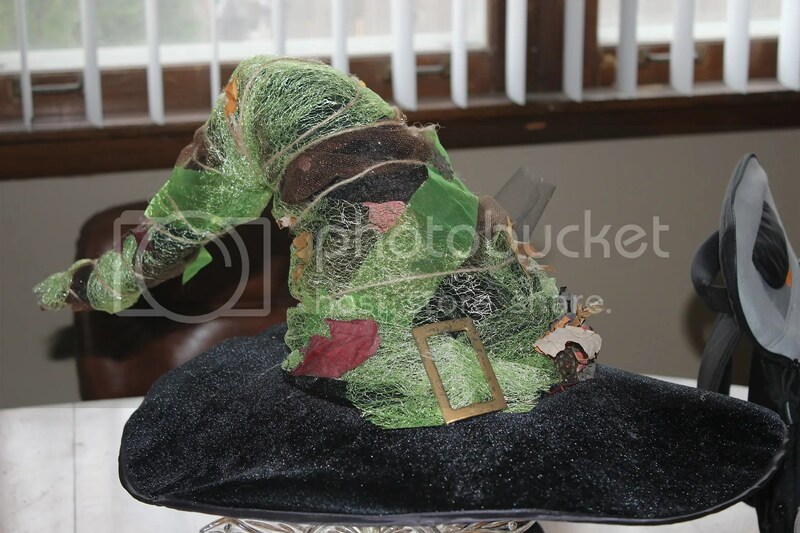 The top hat was made from scratch along with the hat pins. I even made the arsenal of thread from scratch. Last year I was an Umbrella Corp. Chief Scientist in the Bio Organic Weapons Dept. I found the skirt and shoes at a thrift store. My husband was working in a hospital and salvaged the coat and I made the name badge and used iron on transfer paper and printed out the umbrella symbol. So anyway, My daughter needed some leg warmers to complete her costume. I had this old vintage furry coat in the closet not being used and I thought I could use this for those leg warmers :). Now you may be wondering what the Vol. 1 is all about. 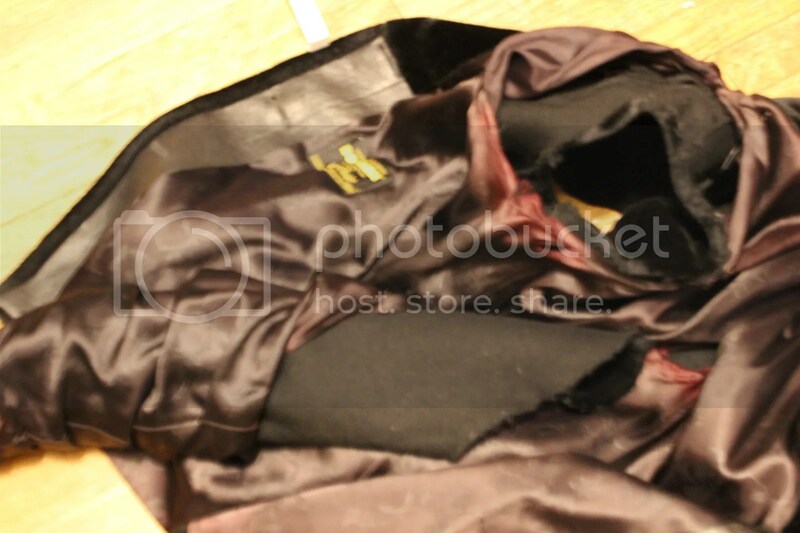 Well I will be making more stuff with the remains of the coat. For now here’s how to make the warmers. Step 1 turn the coat inside out and remove the lining from around the sleeve. Next detach the sleeves using the seam ripper. Next you want to remove the rest of the lining from the sleeve by cutting it off around the bottom of the sleeve leaving enough to tuck under and slip stitch in place. 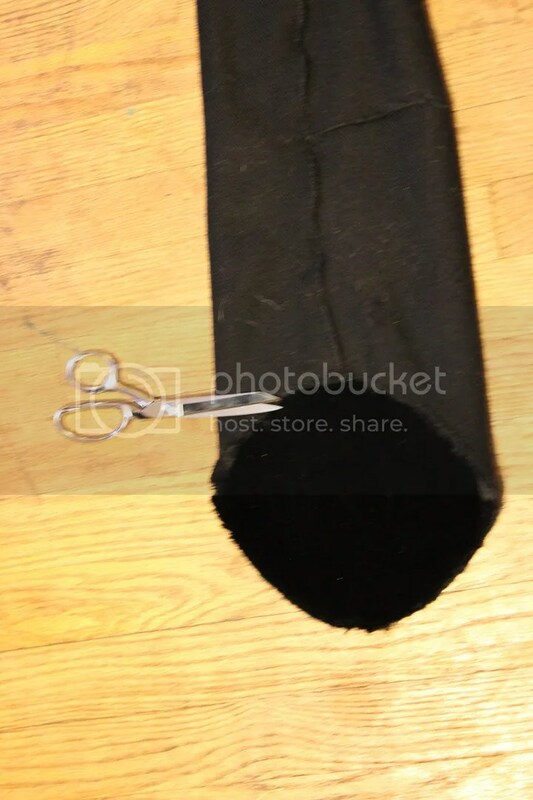 Lay the sleeve flat with the bottom seam up and cut even across, as seen in photo below. 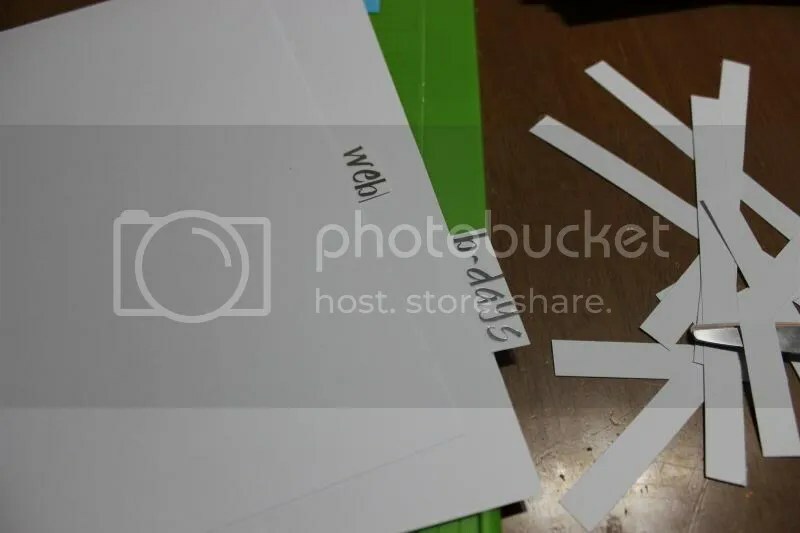 cut across where the scissors in the photo are. Measure your leg or the leg you are making this for from the bottom of the knee down to the ankle. In my case it was 15 inches. fold down the top of the sleeve to so it measures all the way around the measurement you came up with. Next take the elastic and put it under the fold leaving the ends hang out. Over stitch around the fold taking care not to go through too much of the sleeve. when you get almost all the way around tie the elastic making it so it tightens a little. you dont want it to cut off circulation. Then finish stitching. 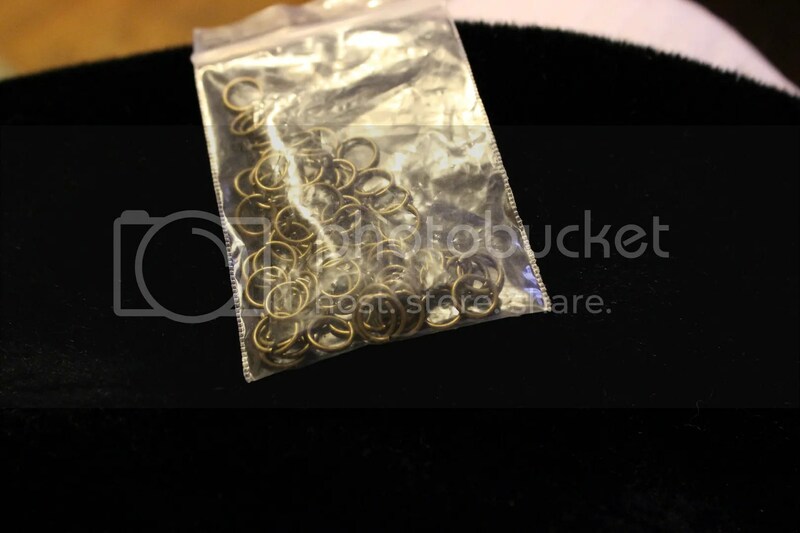 Next take your jump rings out and decide how many to use. I chose to use 5, placing them 2″ apart. Find the seam and lay the sleeve flat with the seam up. Line the jump rings on either side of the seam. This will help you decide how many to use. 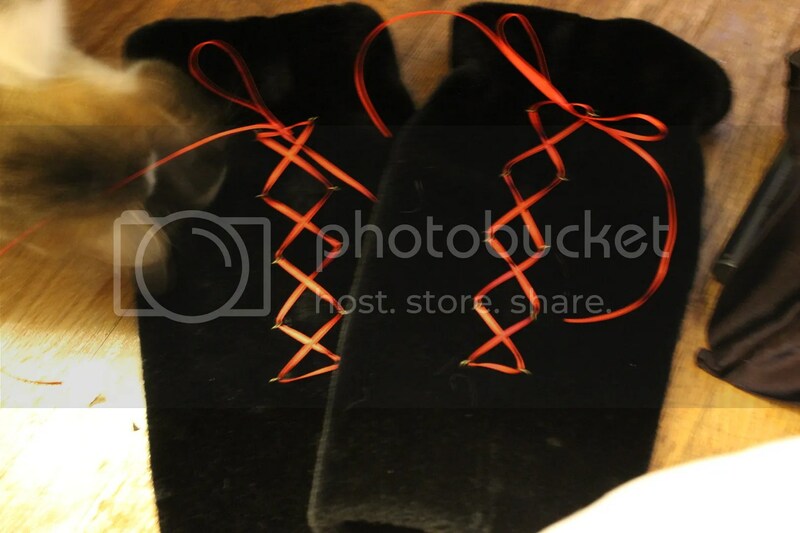 Sew the jump rings in place. I looped around them twice and tied them really tight. Thread the ribbon through the rings. I purchased a few things for the facelift. But still keeping my cost low. 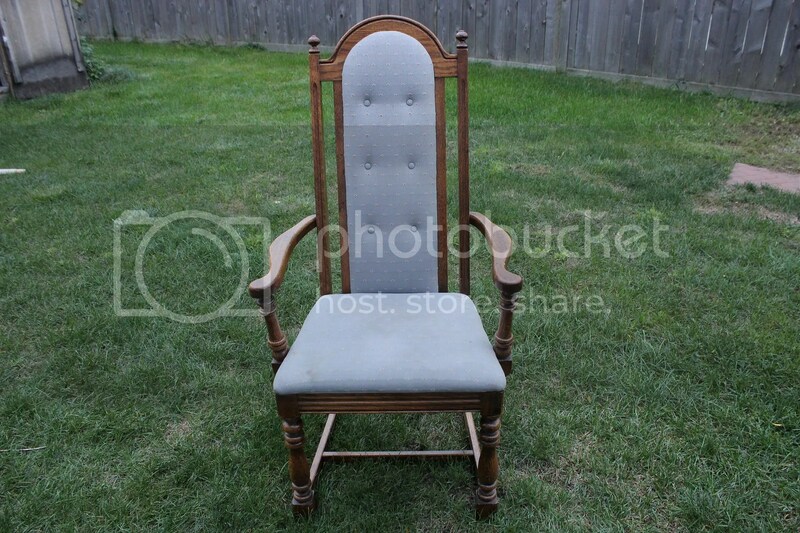 I am going to walk you through step by step on how to give an old ugly chair a facelift! Let’s get started. The first thing you want to do is check the stability of the chair if there are any loose arms or legs you will want to tighten the screw in them. My chair had a loose arm so this is where the drill came in because the screw was under a plug that was flat to the surface of the arm rest. 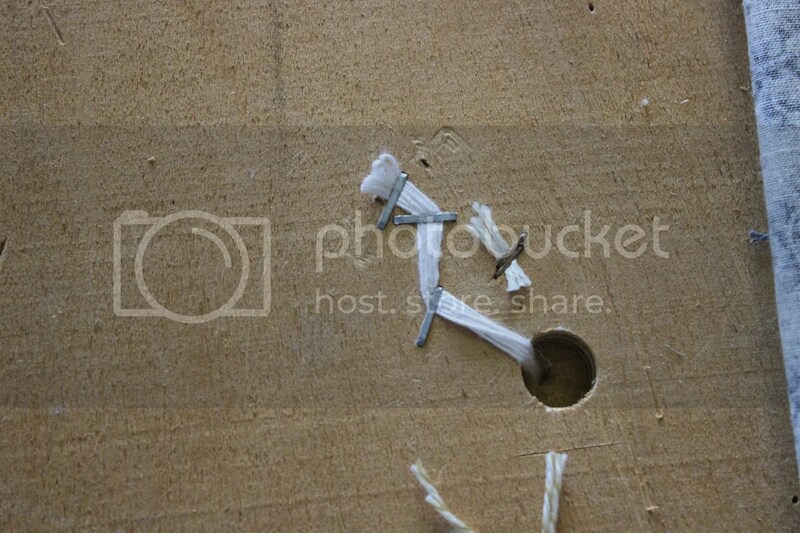 I drilled out the plug carefully and used the screw driver to tighten the screw. Be sure your chair is clean and free of any debris. This is a good time to pull off any pads from the bottom of the chair legs. Now comes the fun part! 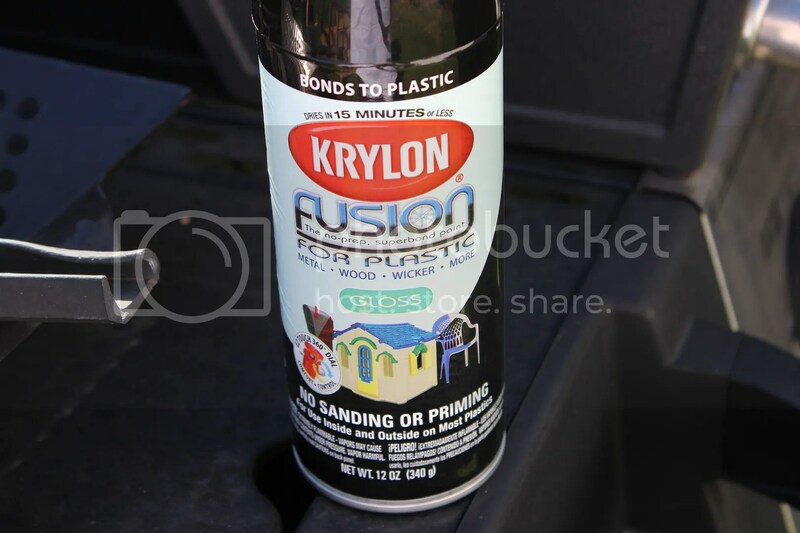 🙂 I normally do not think spray painting is fun BUT with this amazing new product, Krylon Fusion, it makes painting virtually any surface so much easier by eliminating the need to sand!! 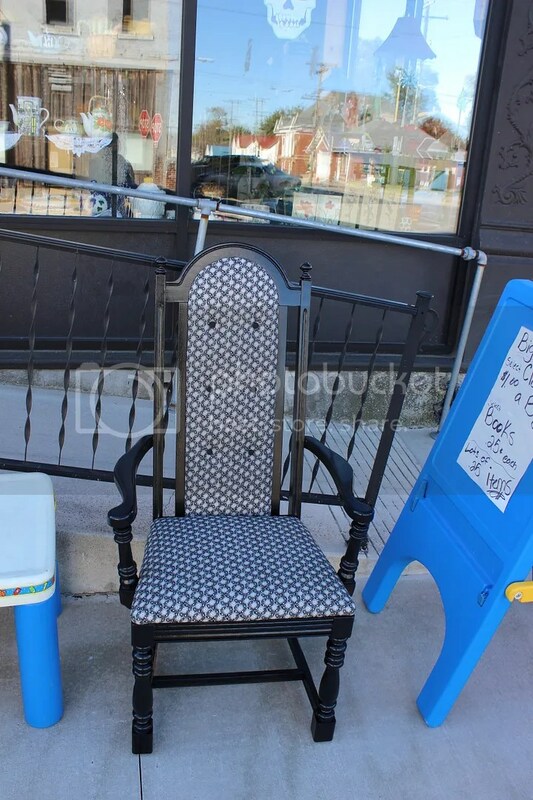 I mean look at the chair, I would need a Dremmel as well as a sander to do this, making it cost more $$ and that is not what I like! 🙂 I like green and frugal projects! So using this wonder product spray the chair. 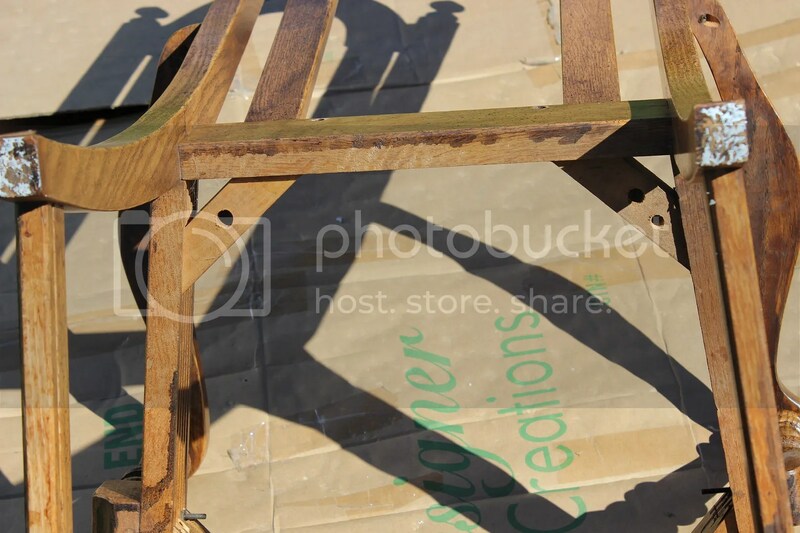 Keep in mind you will get a better finish if you do multiple thin coats as apposed to one to two heavy coats. Also spray those plugs you removed. While your chair is drying lets get to the next step! 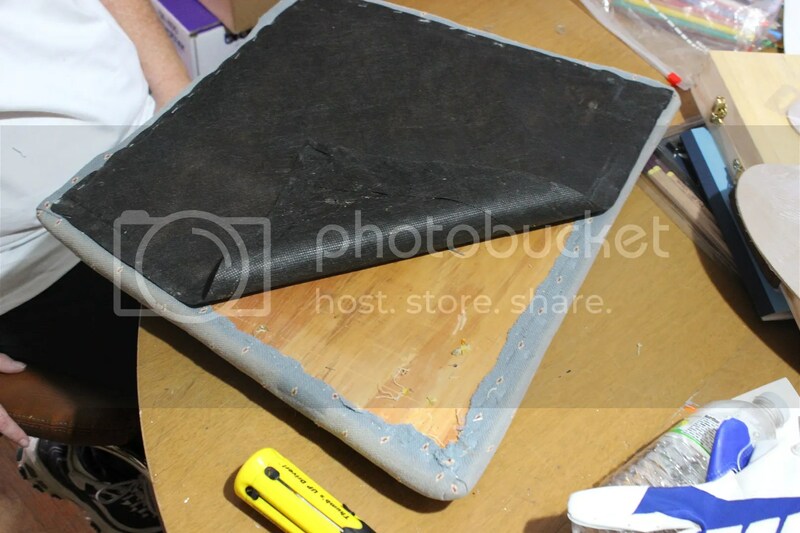 Once you have finished the daunting task of removing the staples inspect the batting and cushion. If they are stained or smell or are falling apart you will want to replace it. 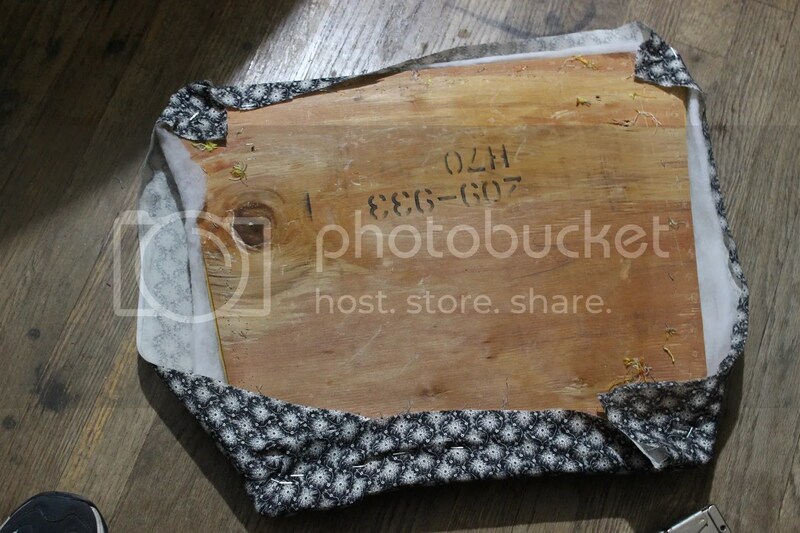 It is a good idea to bring the wood in with you so the employee at the fabric store can cut the foam to fit. Unless you choose to cut the foam yourself. OK so lets move on. 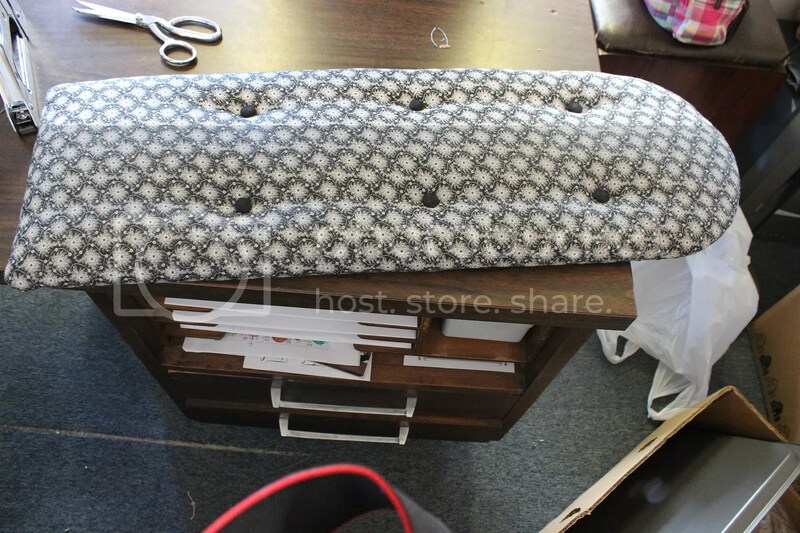 lay the bottom cushion on the wrong side of your fabric taking care to keep the nap in the correct direction. We wouldn’t want horizontal lines on the bottom and angled lines on the back cushion :S Cut around the cushion leaving enough material to fold over the cushion. 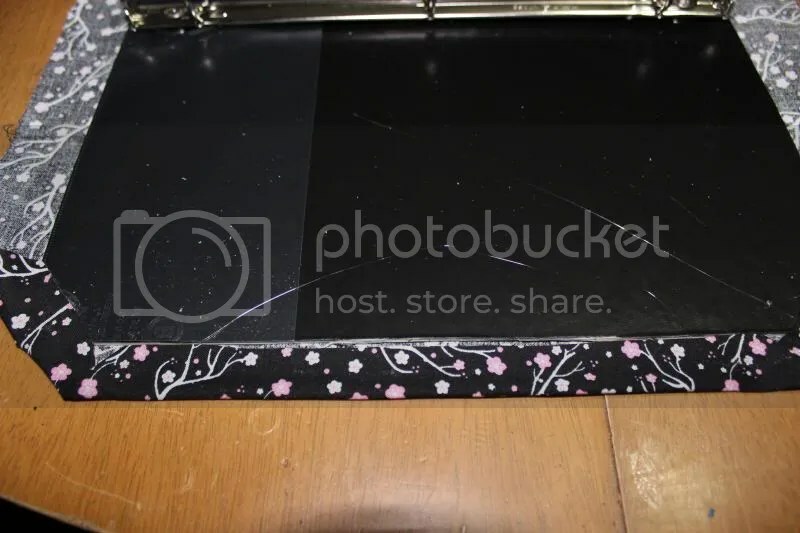 Do the same for the back cushion then flip the material over the back of the back cushion and carefully cut out around the cushion this layer will be stapled to the back of the back cushion because it can be seen… we can’t leave this part exposed. In this next step I chose to re use the tufting buttons that I took off of the chair. I did not see a point in making another purchase if I could make due with what I had. 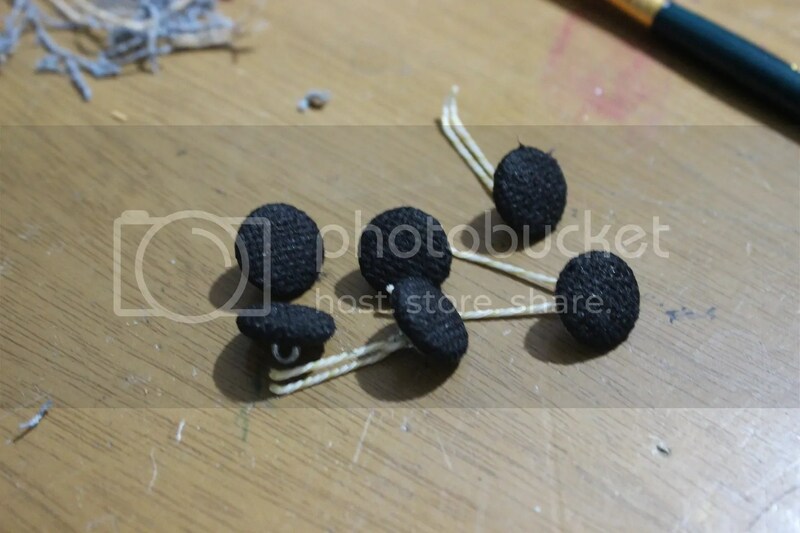 So, I used black fabric paint and a stiff brush and painted the buttons black. Worked out pretty well! 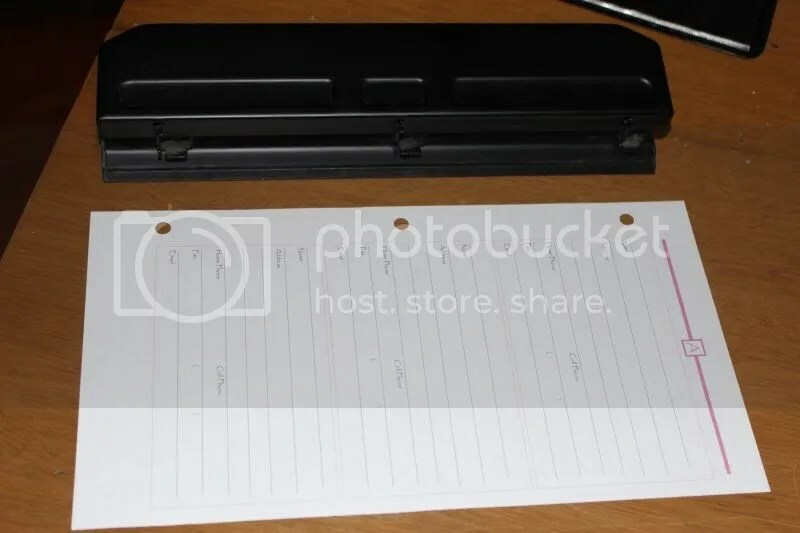 Using your stapler starting with the bottom cushion fold up a corner and secure with a staple, follow the lines left from the staples you removed to ensure you don’t staple too far from or too close to the edge. Next pull and fold over the opposite corner and staple. Make sure the fabric is taut. Repeat on the last two corners. fold over the material close to the corners and secure with a staple making the corner look nice. I like to flip the cushion over to see how the pattern looks.. it may be necessary to pull tighter in some spots than others to make sure the pattern is nice and even. I put in a few staples and check the pattern, pulling tighter where needed. Once the material is secure trim the excess material away. Lay the cover on and staple in place. Follow the same process to cover the back cushion. Before you put the cover on the back use your tufting string and needle to put the buttons on. 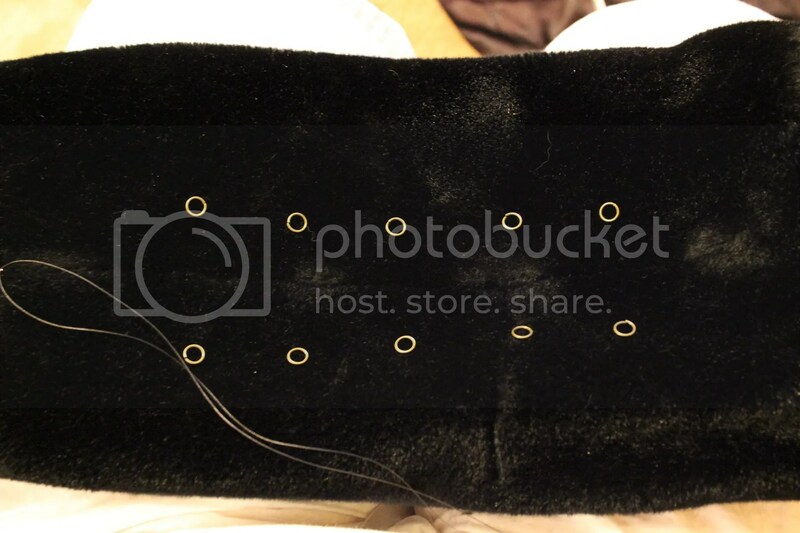 Start in one of the upper holes on the back of the cushion and secure your first button. Do this by pushing the needle through the hole then through the back of the button then back into the cushion and out of the back. Remove the needle and pull the string tight and secure with a staple, pull to the side slightly and secure again two more times or so. 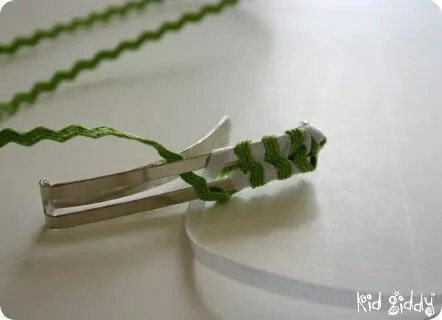 Do not staple the string straight, you want to zig zag the string and staple this will keep it from pulling out. Now cut excess material cover with the piece you cut out and staple in place then trim excess. If you have not taken a break, now is a good time. Do some stretches or have a cup of coffee! 🙂 Laundry.. YUK! lol anyway you should step away if you find you are having difficulty throughout the project. I find that if I do this when I come back to it, my head is refreshed and I am ready to get it finished! Alright we are ready to get the cushions back on! wohoo! 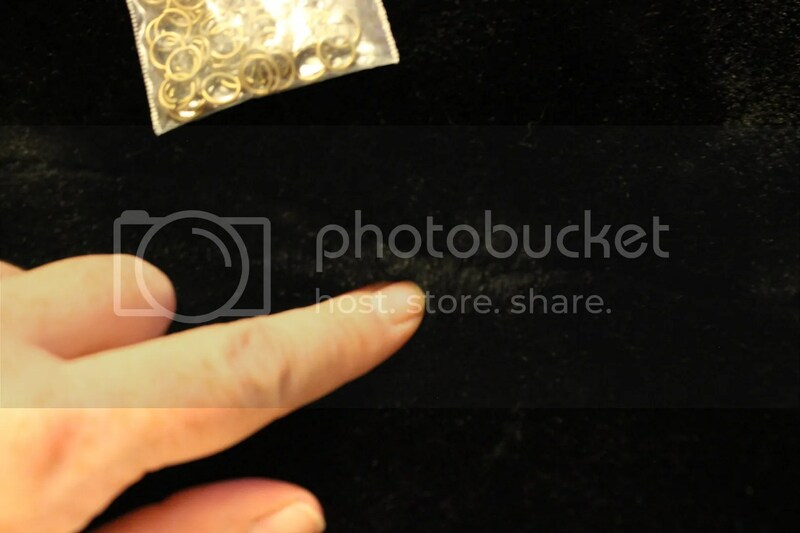 So if you listened to me your screws will be all secure in a baggy. grab them out and re screw them into the cushions.. Don’t over tighten them. You want them tight then a quarter turn. 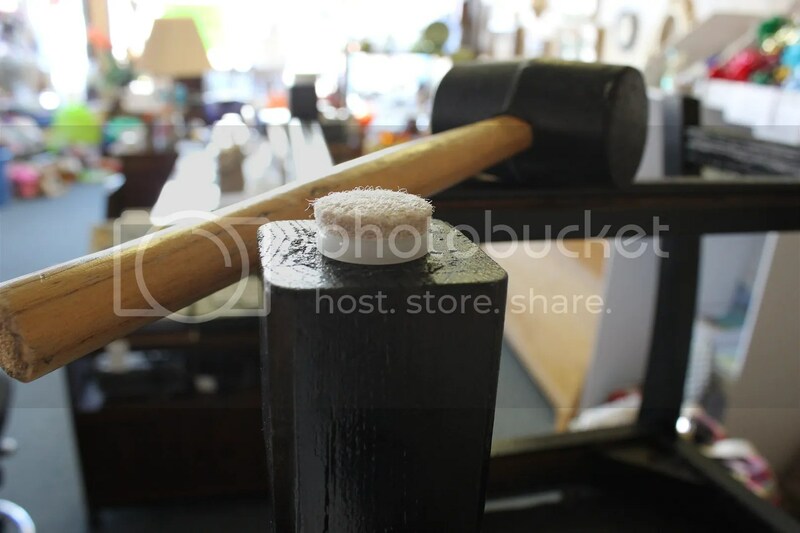 If you saved the plugs using a rubber mallet pound them back in. Last step before enjoying your new old chair. 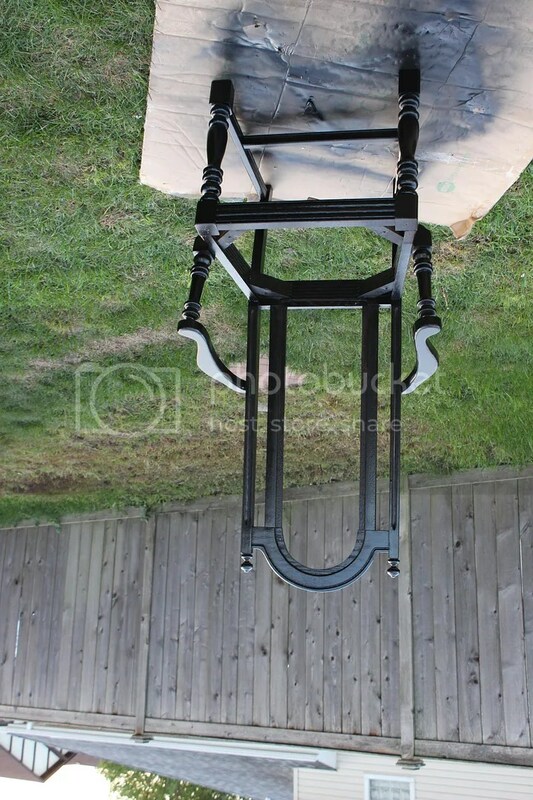 Flip the chair over onto a table if it has not been at least 4 hours since you sprayed the chair put it on top of a towel or two to ensure you do not chip the paint on the arms. 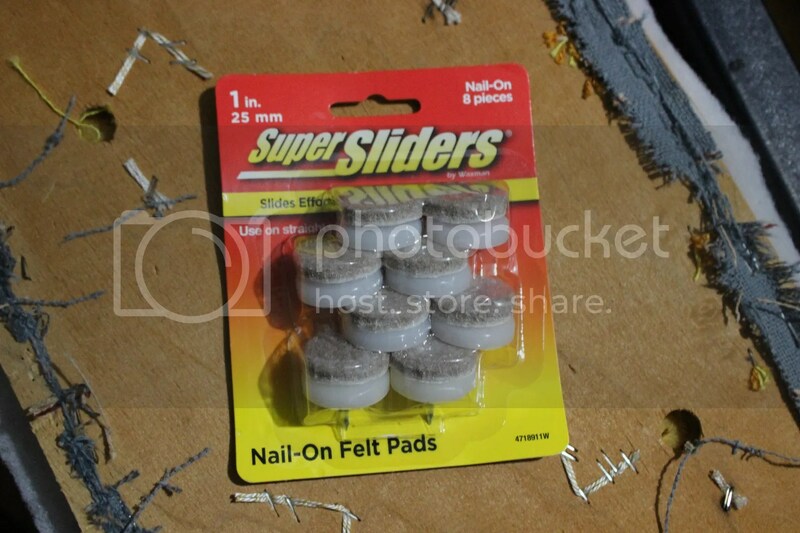 Using your rubber mallet pound in the super sliders onto the bottom of the legs. Till next time, Keep it green, keep it frugal and keep it CRAFTY! I’ve always had a green thumb as long as I can remember. I think it was a trait passed down from my Grandmother cause my Mother also has a green thumb. Something about growing plants. 🙂 I have always been interested in growing seeds from produce I buy at the store. I have had a lemon tree growing in a pot for 12 years now, that I started from a seed I saved from a lemon. 1 more year and it will start to bear fruit. Lemon trees take 13 years to mature. I recently found out to trick them into thinking they are older to bear fruit much sooner you can prune a stem from an old lemon tree and root it. 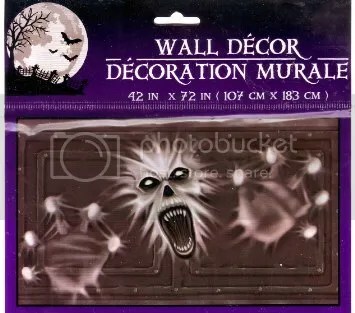 I think that may be one of my next projects! Anyway, that is just one thing you can regrow at home. Today I’m going to be talking about my latest veggie I decided to give a go at regrowing and so far it’s coming along very well! 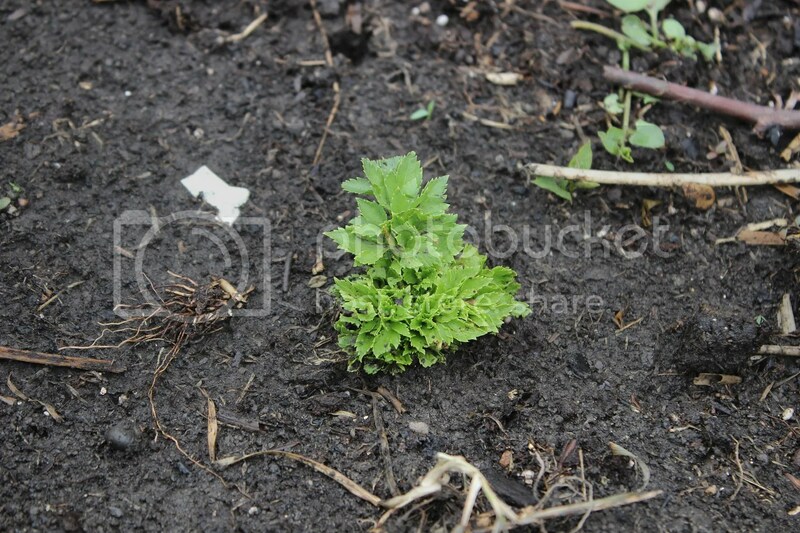 Yes, you can regrow celery you bought at the store! Here is how..
Start out with a head of celery. Cut off the stalks close to the bottom leaving about an inch or two. Set your stalks aside, we are going to fix those up later in this post. 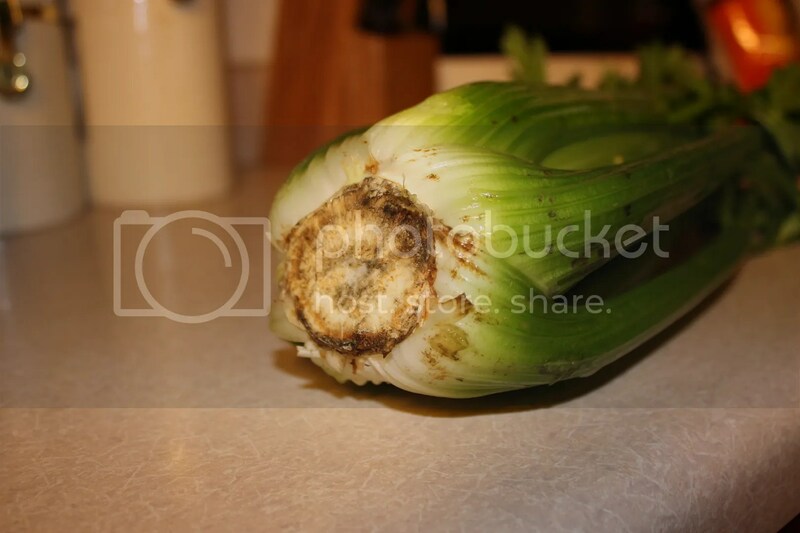 The bottom of the celery head is where the roots will grow from. Your celery head may have a few small roots already growing from it. Don’t be discouraged if it doesn’t. As you can see mine didn’t and was cut really close to the stalks. Next you can choose to plant your celery out in your garden or you can start it in water in a shallow dish inside or in a pot inside if you wish to grow it over the cold months. I chose to plant mine in the garden. When planting in soil plant it down just enough for the nubs of the stalks to sit even with the soil or just under. In my photo below mine where even but with watering and rain they got covered. Be sure to water your celery after planting it and be sure to keep the soil moist. After the roots take well you won’t have to worry so much about the soil staying so moist. 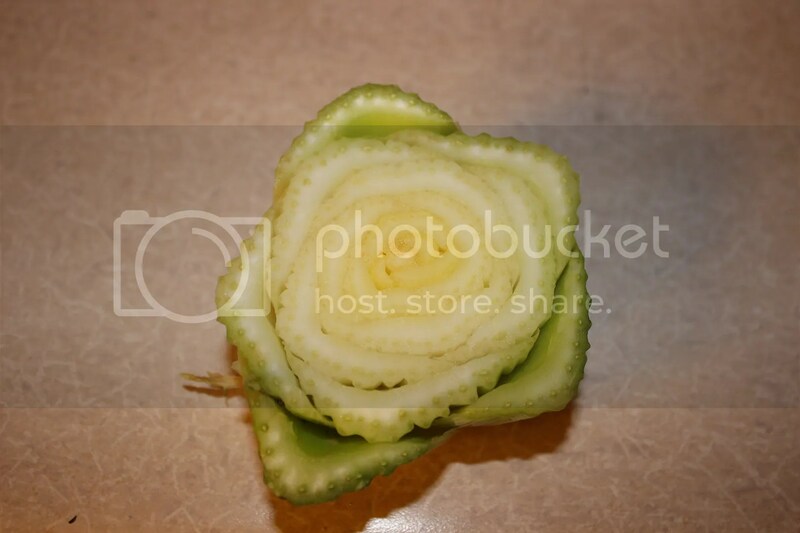 When preparing your celery for regrowing, you can also choose to snap off the stalks leaving only the center most hearts of the celery and plant that. This will grow your stalks much faster. 🙂 This process I am going to try indoors over the colder months. Cut off the tops of the stalks and recycle in compost or use for stock or to feed your bunny 😉 The leaves can be used in salads and can also be dried and used for seasoning. Clean the stalks well. I use my potato brush to scrub them. Store them in a Ziploc bag until ready to use. 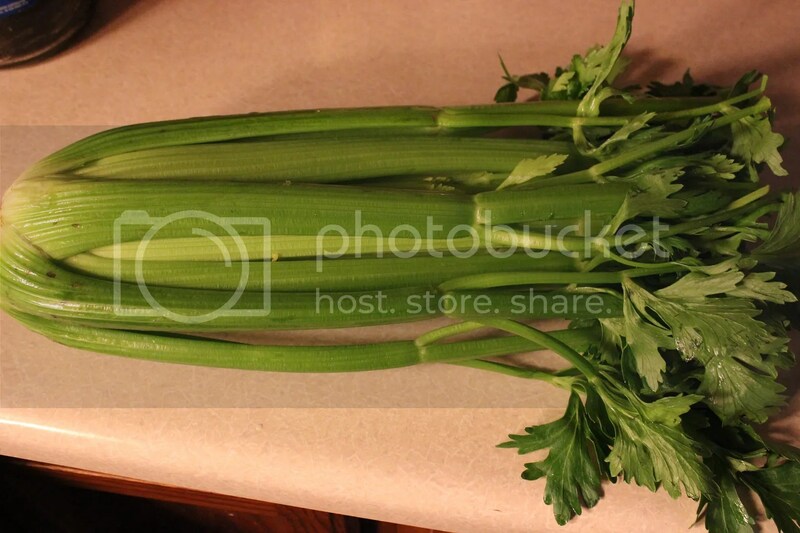 OR If you notice your celery getting limp, simply place them in a container with water stored in the fridge. They will crisp up in a few hours or less. I use bottled or filtered water for this. Celery is also a good alternative to smoking… I know this from personal experience and experiences shared with me by others. When trying to quit smoking carry around some celery in a small bag. Whenever you feel the urge to smoke chew on some celery. 🙂 It worked for me. 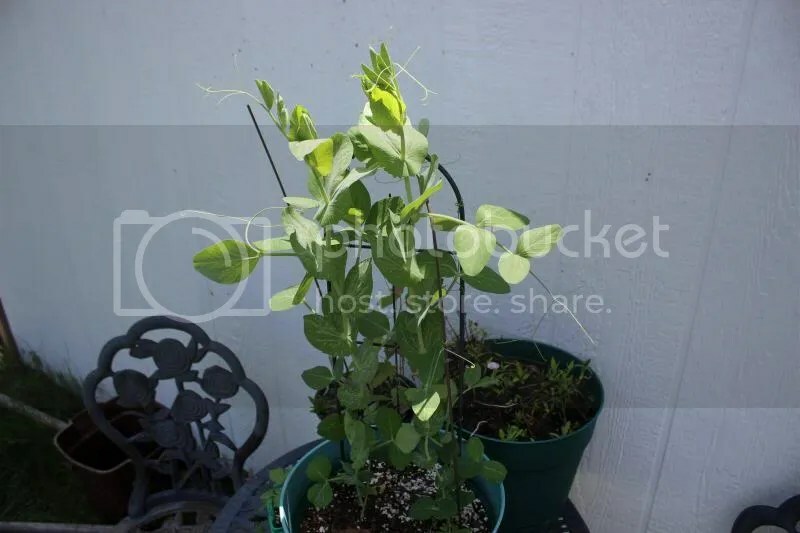 In the meantime remember my last post about my sweet peas? Here is an updated photo. My how they’ve grown in just 7 days! To get started I used this Pattern I found on Burdastyle.com found here. I must say this is a great bookmark!! I have referred to this site on more than a couple occasions. The first time on A knock off rock a billy dress. Post. It is great to learn and have around for sure! Before you know it you will be making circle skirts for all the girls in your family! I cut out the lining and then 2 layers of tulle. You can add as many tulle layers as you like. measure your waist and cut your elastic be sure to add an inch or so. finish the edge of your lining and them using a zig zag stitch attach the layers to your elastic. 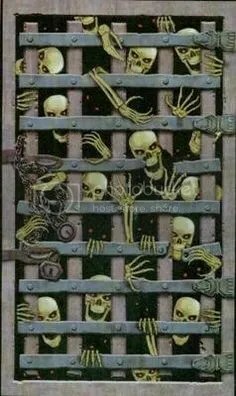 You may need to gather. If you want a fuller skirt add an extra inch to the waist measurement for the circle skirt making sure to compensate the inch for the length. not my favorite picture but I wanted to show the length. Thank you to my daughter for having fun taking these pictures 🙂 I made the lovely owl necklace in the picture as well… Perhaps another post? The Big Day… A Sweet 16 to Remember. I do hope everyone is enjoying this weekend! Well the big day came and went and I am satisfied with the results! It was a great party! I am going to share all of my prep and party planning. I saved big money on my daughters sweet 16 party by cutting a few corners and doing the work myself. We started the day finishing up food prep and getting all the snacks ready. The menu was simple, I didn’t want to have a ton of leftovers and I didn’t want to over spend on food, too much food means too much time away from doing other important things. So we kept it very simple. For starters we ordered a 6ft sub from the Walmart Deli. We had ham, turkey and American cheese on the sub and had all the condiments on the side so everyone could choose how they wanted their sandwich. I found that it is much cheaper to order a full sub as opposed to ordering individual sandwiches or even a cut sub. It is so simple to just cut it yourself. The sub can be divided and wrapped in saran wrap and put in the fridge until it is ready to be cut later in the day. I cut the sub into individual sandwiches and arranged it on a large platter. I made a large pan of my ‘famous’ mostaccioli. ( I have several people that ask if I’m making it for every party, I think they secretly only come for the cioli.. lol) 🙂 I can make a large pan of it for as little as $10. The most expensive thing in it is the cheese. The mostaccioli was prepared the evening before and cooked in the oven the day of so it was a very quick and simple dish. For garlic bread to go with the pasta I used 4 cans of biscuits cut each one in half and stretched each piece a bit then sprinkled with garlic powder and oregano and baked as directed. I made frozen grape kabobs the day before the party. These are simple and easy to make and cheap if you get the grapes on sale. Because they are frozen they keep for a while in the freezer! Trust me this will be the first dish to go. 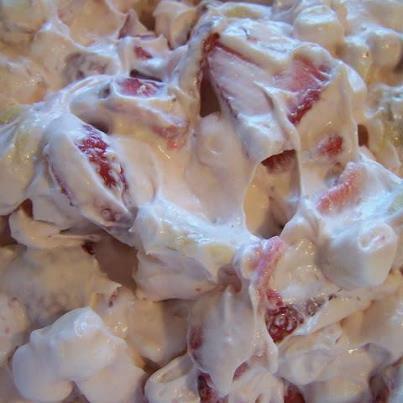 🙂 I found a recipe on Google for a strawberry cheesecake salad. Sounds yummy right!? It is! And very simple to make! Most of the prep for this salad can be done the day or night before the party. I mixed the liquids and powder the night before and also cut the strawberries and sealed in a Ziploc. The only prep that can’t be done before hand is the cutting of the bananas because they will brown if they sit too long so those get cut just before serving! Check out the recipe below! I put out a tray of assorted snack crackers and a cheese spread. Potato Chips, pretzels, tortilla chips and salsa were put in bowls and all set out on tables for a simple snack item in reach. For beverages I filled dispensers with Country Time pink lemonade and homemade sweet tea. I also had bottled water and 4 3 liters of soda. I wanted to make sure we had a nice assortment of beverages. Remember not everyone drinks carbonated drinks! Our total cost altogether for our entire food and beverage menu was just about $75. I purchased as much as I could from the dollar store and Aldi and I made sure to grab what I needed in advance when there was a great sale and I had a coupon. By making my own large pan of pasta I saved $40. Compared to our local caterer. So any entre you can make, like baked or fried chicken etc. that is simple for you do it yourself!! You will save big $$! The next step of day was putting up decorations. The party colors were black and purple so all of our decorations were those colors. 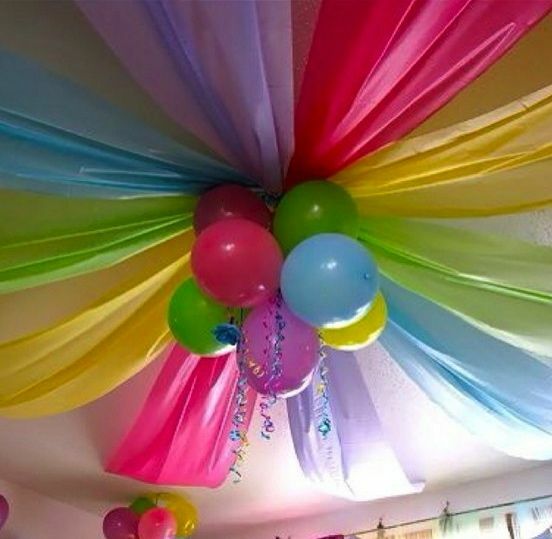 We found this neat ceiling decoration on Pinterest and did it in the party colors. We also used streamers. We had plans to set up a large tent in the driveway where the dance floor would be however due to high winds we were unable to use the tent. But the birthday girl didn’t seem to mind. We put black and purple table cloths on all the tables. Using Avery.com I made coordinating signs for each table. 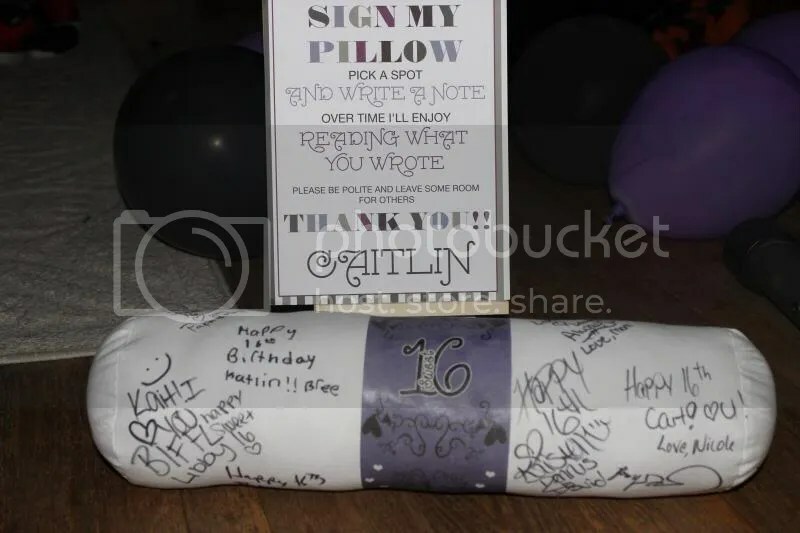 On the gift table we placed a sign with the signature pillow I created a while back. The guests were able to sign it when they placed gifts and cards on the table. The sign reads: Sign my Pillow Pick a spot, and write a note, over time I’ll enjoy reading what you wrote, please be polite and leave some room for others. I created a nice candy buffet in rainbow colors. The birthday girls favorite candy is skittles. We put another sign on the buffet table along with some bags and ties that had a little thank you card attached. The candy buffet had skittles, the dum dum tree, marshmallow horns (unicorn horns), life savers, gummy bears, pixie stix, Twizzlers and gourmet marshmallow pops. I used black and purple ribbon and circle tags that coordinate with the signs also made on avery.com as seen in this post for the sweet 16 invitations. We left a space on one side of the candy buffet table for the cake. A friend of mine volunteered to take on this cake my daughter wanted. She had several different cakes she liked and my friend put all three of them together and came up with this gorgeous cake design. We put together matching plates, napkins and silverware with coordinating circle cut outs for the cake. I set up a photo booth for the guests. 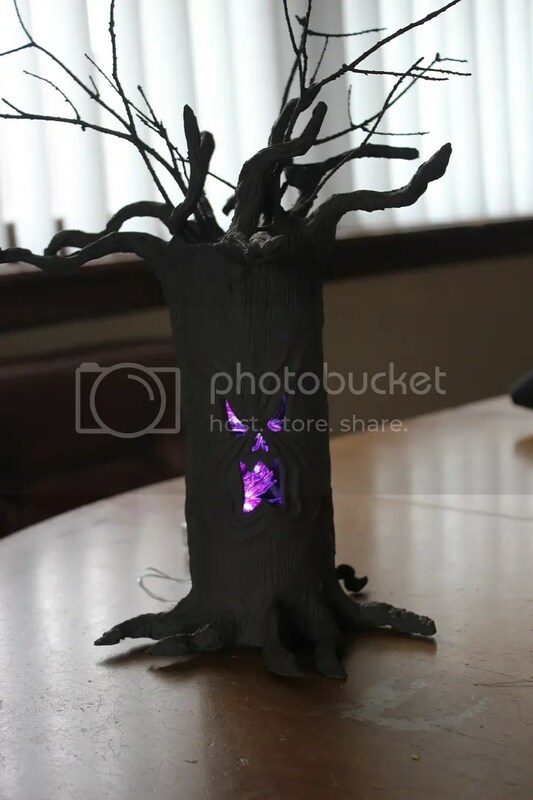 My daughter and I spent 8 hours creating photo props. We wanted to have a large assortment. We also spent a few bucks at the dollar store for some neat glasses and a few other props. 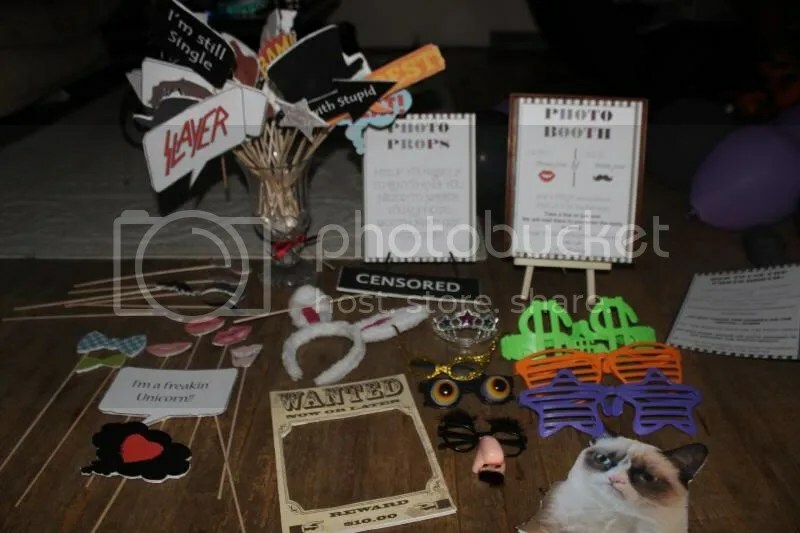 I made signs for the booth explaining how to use it and also one for props and one explaining the photos will be mailed out after the party. I also made a little sign for the entrance saying open on one side and closed on the other. The booth wasn’t open the entire day because I of course needed the camera to take pictures. 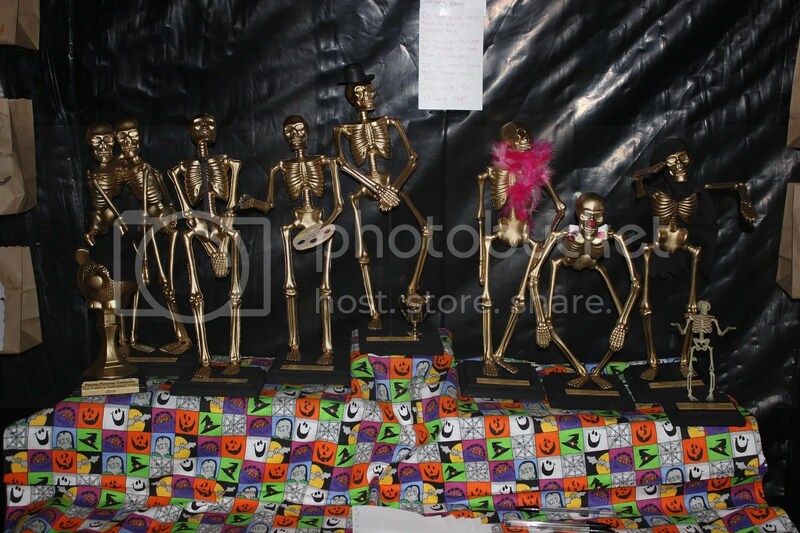 we had a ton of props! 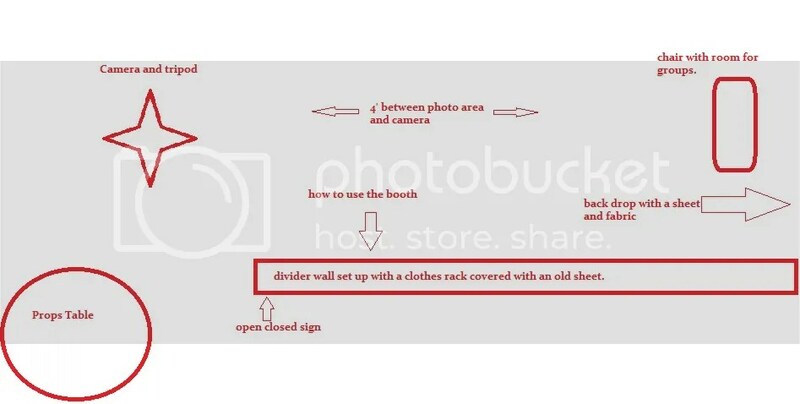 This is how the booth was arranged. After the party we sent out the guests photos on these neat photo strips I created using adobe elements. The festivities started with the birthday girl being crowned, My hubby and I found the this beautiful tiara at The Icing in the mall. Her Daddy is so proud. Opening the gift from us. I couldn’t book her favorite band for her party but I did the next best thing and bought her 4 tickets to see them next month. She was totally not expecting them especially having this big box to open. 🙂 She was so happy she cried. That is it. The day was absolutely amazing and I am sure it was extremely memorable for her! 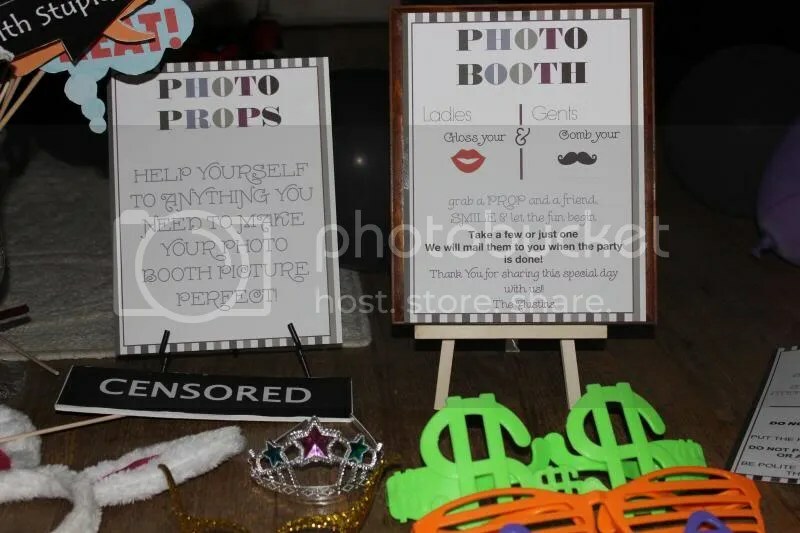 Coming up I’m going to be posting info on how to make the food and a how to for the photo booth. I finally got it done and all worked out! First the FREEBIE I created!! 😀 Let’s get the files we need. I have below links to download each of files you will need including a file with instructions on how to change colors and print the documents. You don’t have to be a pro at word and I am here to answer any questions. Now that you have the documents downloaded lets get them printed up. I wanted to make this as simple as possible. If you are ok with the color they are then all you have to do is follow the instructions on changing the Letter and the Months. Get your pages all printed out. Here is a list of the materials you will need to do this project. First we will need to prepare the paper. So on a nice large and clean work area get your cutter and print outs. 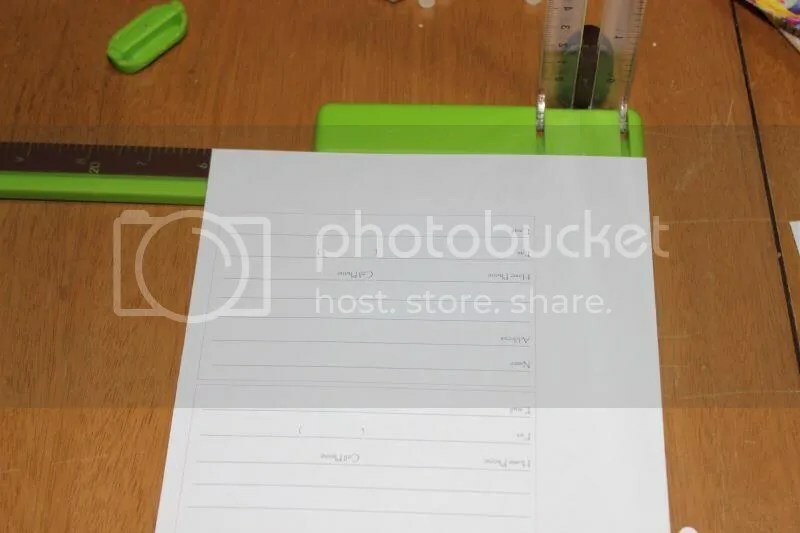 As seen in the photo below you are going to measure the left side of your page to 7 inches and cut. Next turn the page so you are cutting on the opposite side line up to 6 inches and cut. As seen below. Do this with all of the printed pages. Next we are going to punch the holes on the right side of the pages. Your pages should look like this. Next step we are going to start making the dividers. 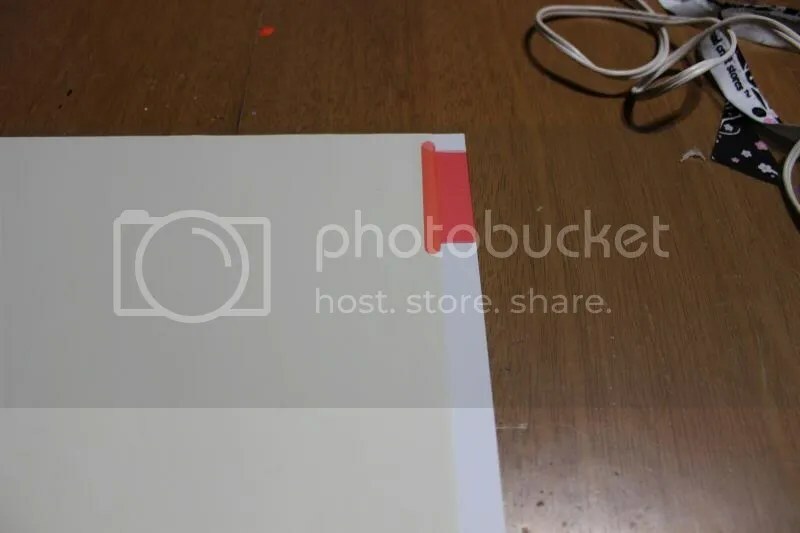 take one of the dividers and line it up on a piece of card stock as seen in the photo below. 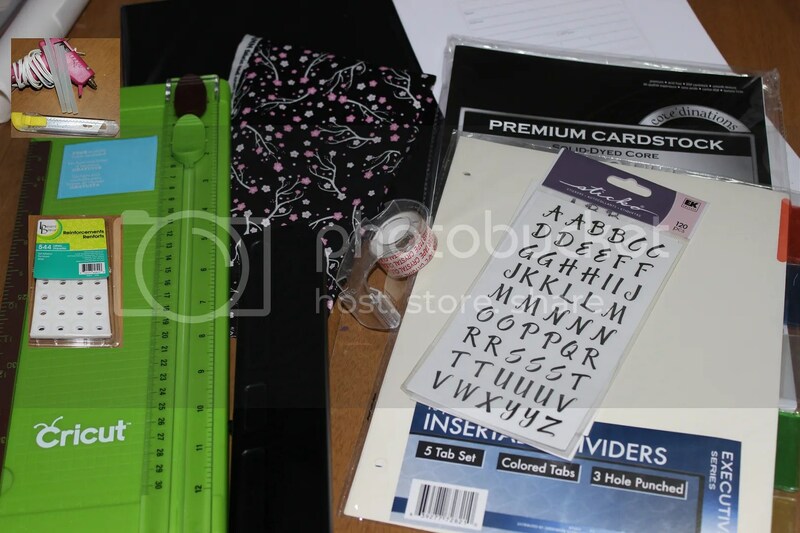 Use a pencil and mark a line down the card stock. This section should be ½” wide. Now affix the uppercase letter A at the very top right of the card stock. 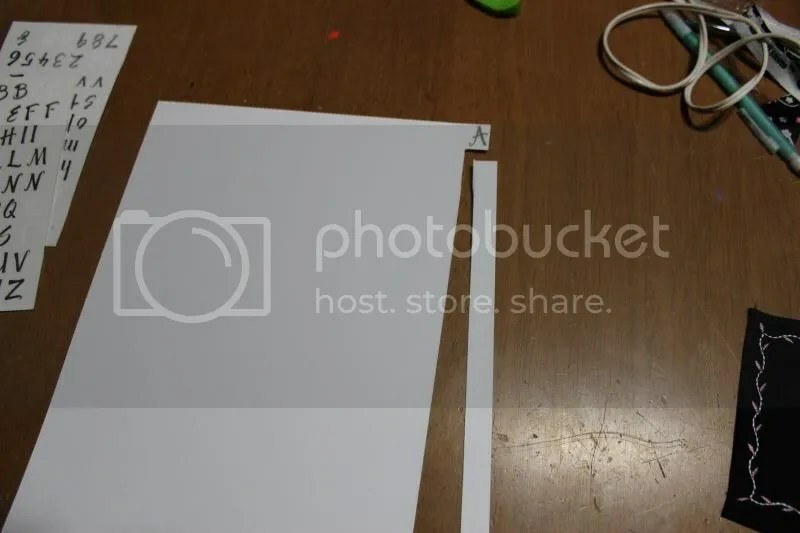 Using scissors make a horizontal cut under the A to the line you marked in the last step. 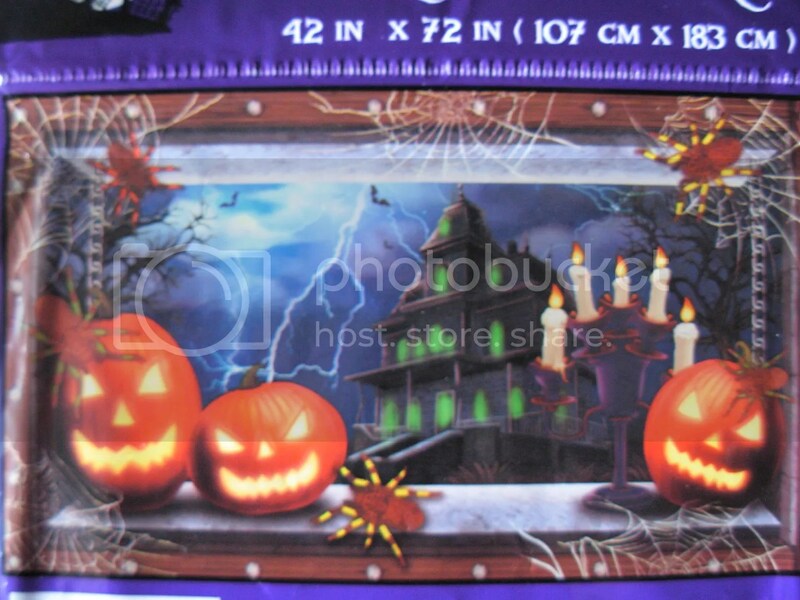 Using your cutter or scissors cut off the strip you marked. If you use the cutter make note of the measurement for the cut this way you can just use that for the rest of the tabs instead of marking each piece. Your alignment for it should be 8″ so you are cutting off a ½” strip. 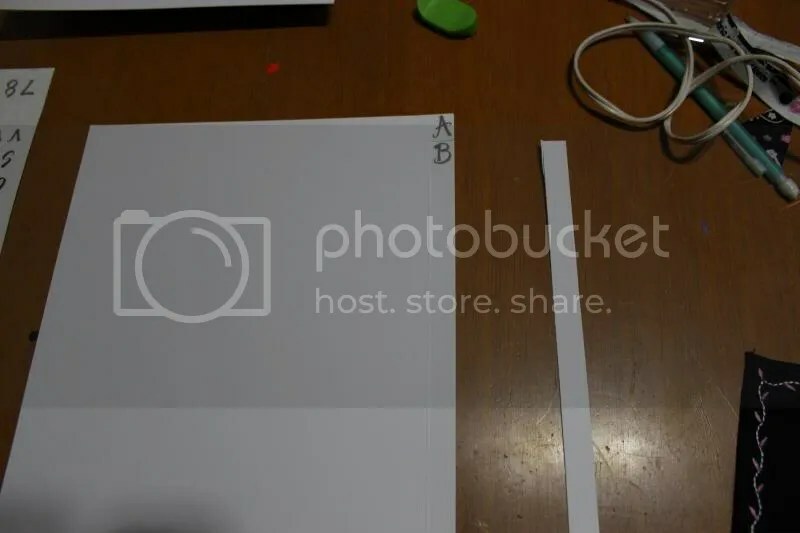 Line your Letter A tab card stock up onto another piece of card stock and affix the Capitol letter B just below the A. Cut horizontally on the top and bottom of the letter B ½” in close to the letter. Cut off the strips as you did with the Letter A tab. Depending on the size of your letters you should have Q at the very bottom when you get to that letter. If not that is fine. Just continue the last steps until you get to the bottom. Your next letter will be at the top of the next card stock page in my case it was the letter R. Continue on to Z. Next step can be tricky. We are going to cut the dividers to fit. 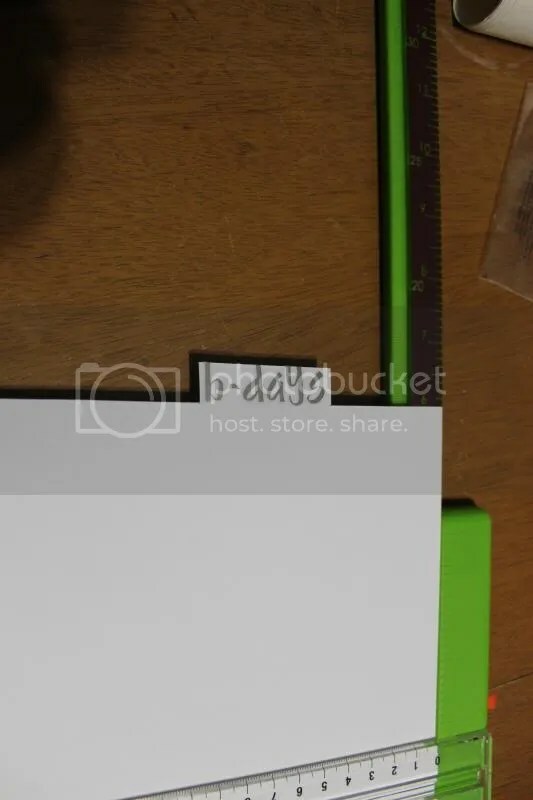 Turn the dividers so the tab is on the left side of the cutter and line up to the 6″ mark. DO NOT measure the tab! See the photo below for proper measurement. 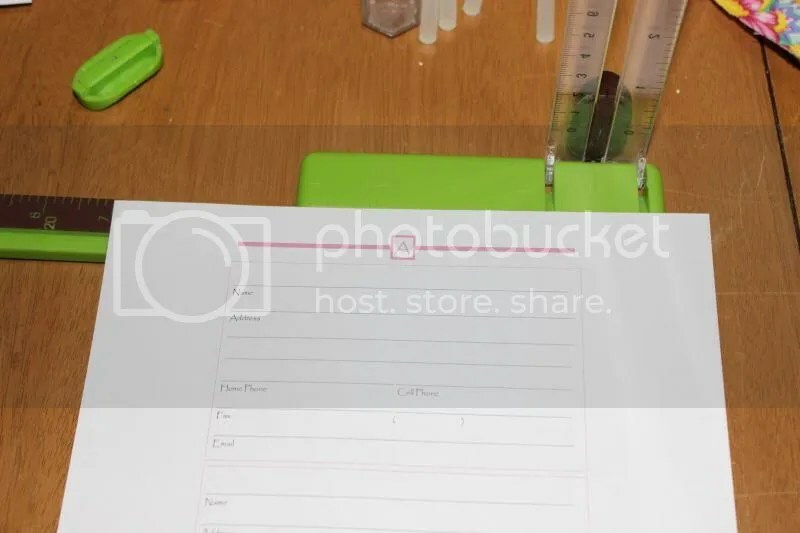 Cut each divider then punch in the holes on the opposite side of the tabs. 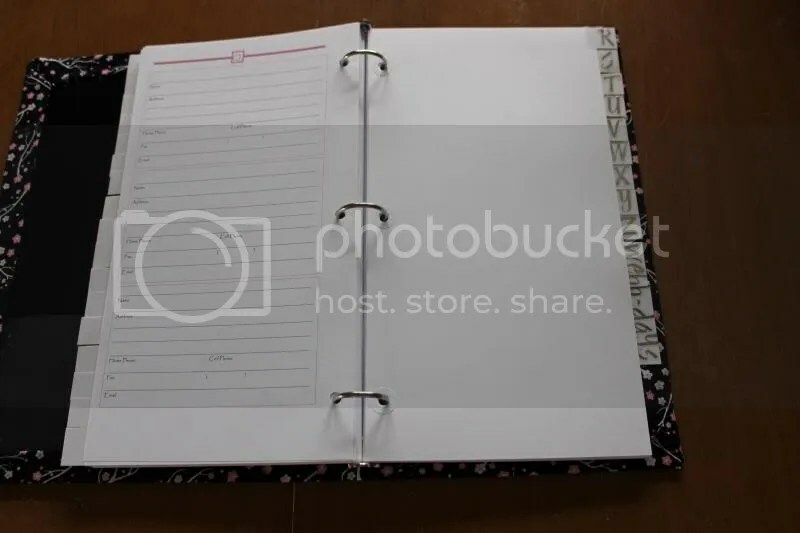 Now we are going to move on to the binder. So put all of your paper aside clean up your space so you have a nice clean area to work in again. 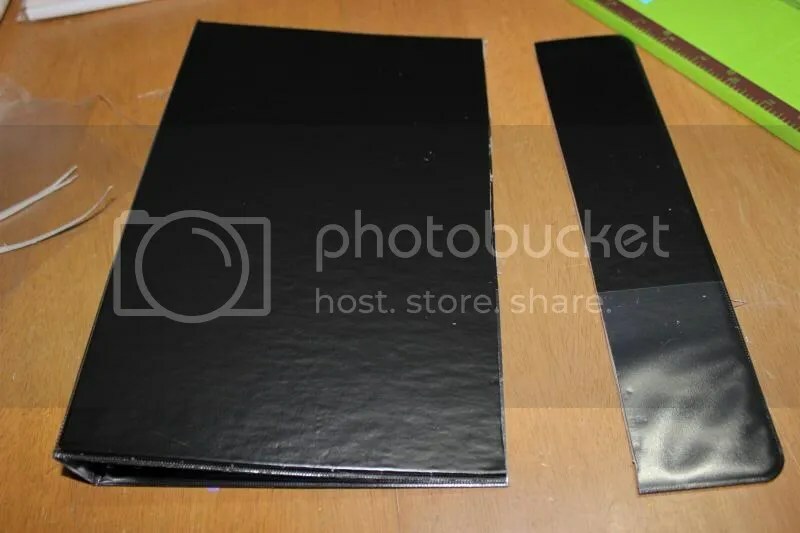 Close the binder and using the cut side as a guide cut the other side off of the binder. 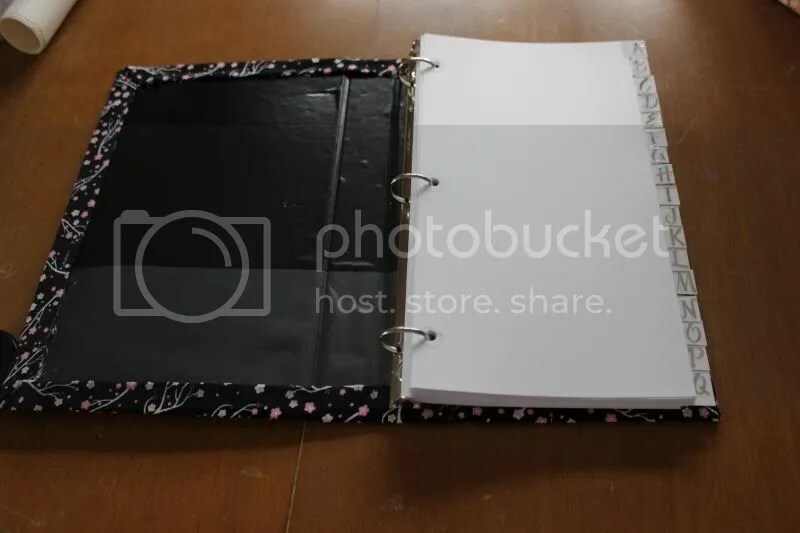 Open your binder and lay it on the wrong side of your fabric. 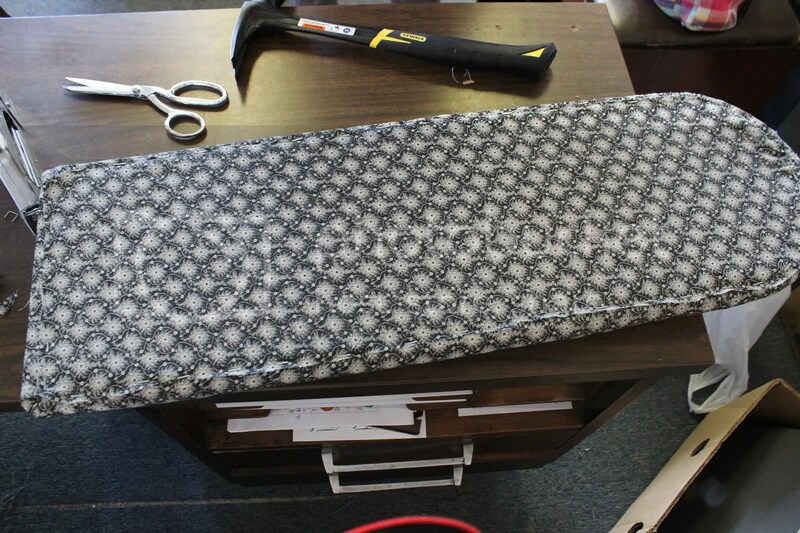 Cut the fabric leaving about 2″ all the way around the binder. fold in the 4 corners hot gluing them down trim the point off. 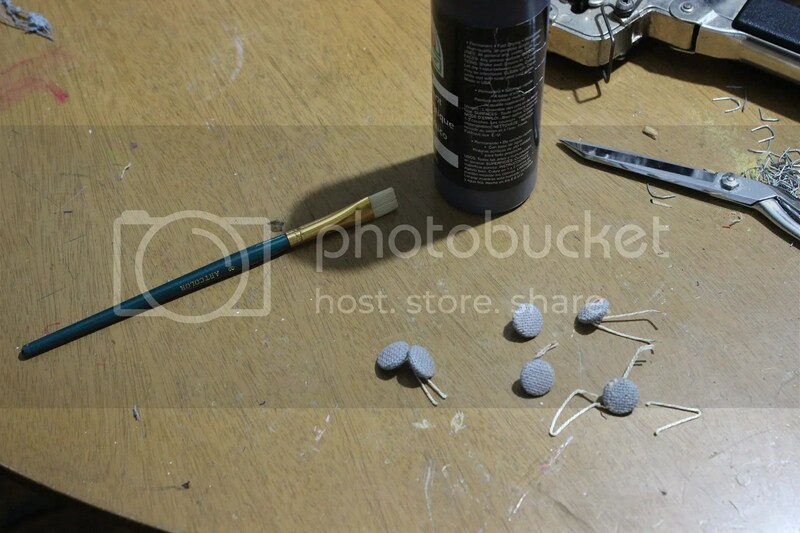 Run a bead of hot glue down the side from corner to corner and fold the edge in half. NOT over the binder yet! this will make a nice clean edge. Now run another bead of hot glue this time fold over the binder. 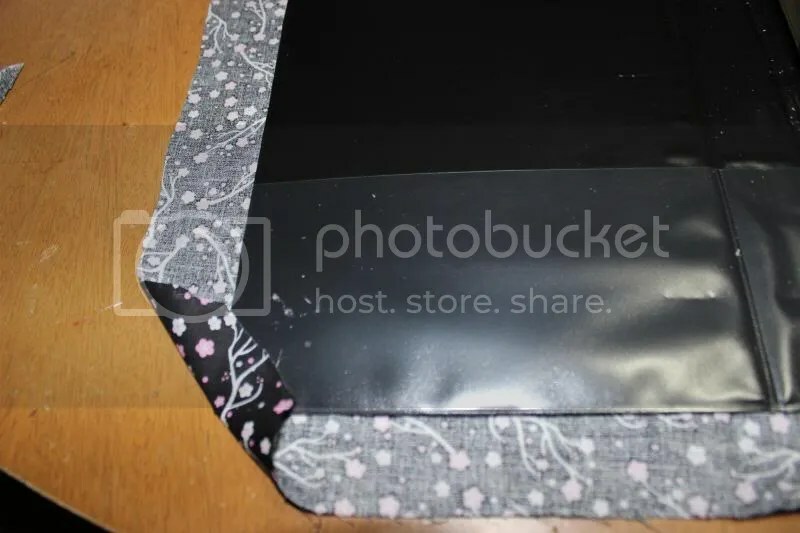 Do the same for all 4 sides making sure you pull the material taut so there are no wrinkles and it is nice and tight to the binder. 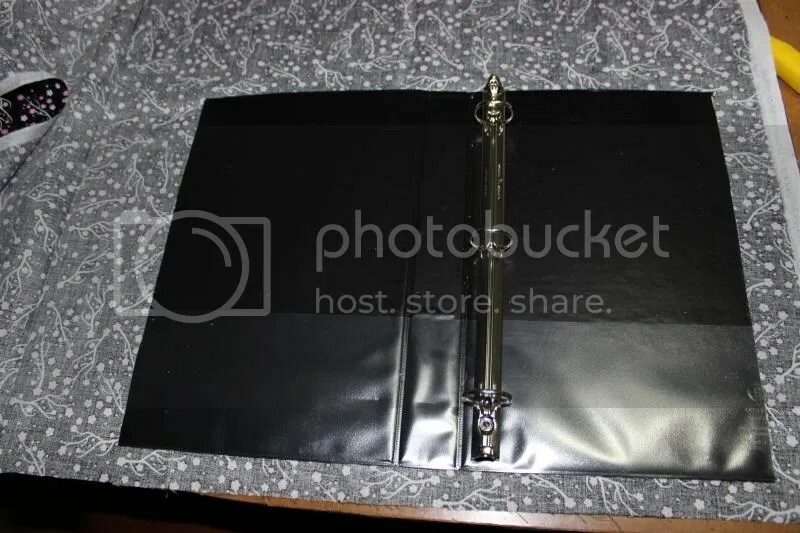 You can also spray glue the material to the binder if you like. Make sure the edges are glued down good adding more hot glue if necessary. Next step we are going to start filling our binder! Before putting pages in put the reinforcement stickers on the front and back of your pages. These will help your pages last a long time. 🙂 You can put them on one side only if you like. Or not at all! Remember the best part of this project is you make it your own! As you can see I only put my reinforcements on one side but I am going back to add them to the other side too because I have plenty left over! Here is my finished book! As you can see I added an embroidered patch to the front of my book that says Addresses. You don’t have to do this or you can! It’s all customizable to you! 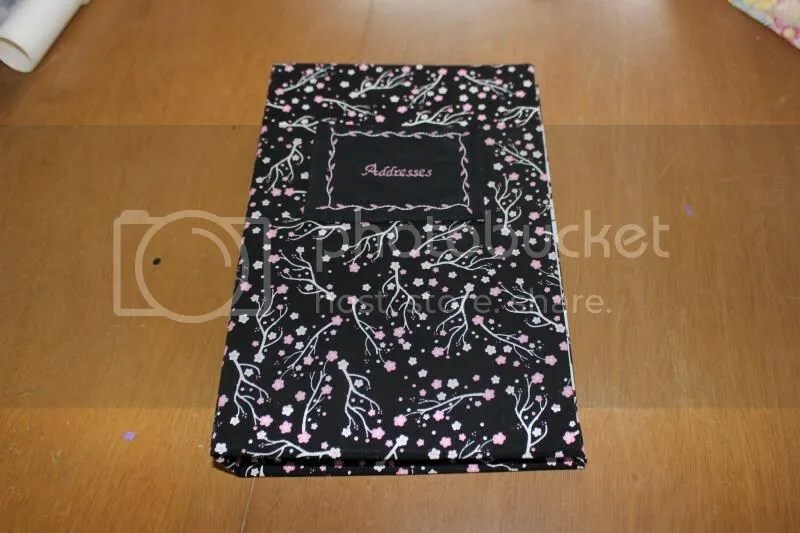 The final step is to put write in your addresses and enjoy your custom made address book! I hope you enjoyed this tutorial and the freebie! Does it look complicated? If you said yes… I have some good news.. it isn’t! 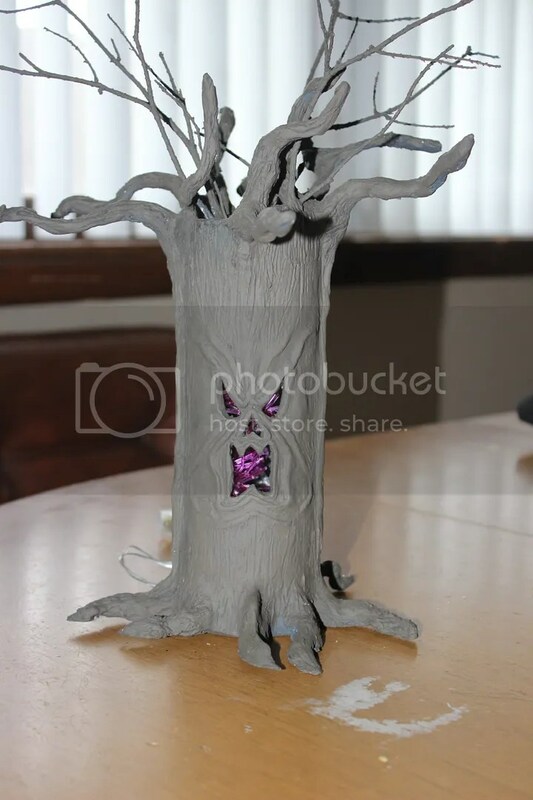 It is also surprisingly cheap to make! 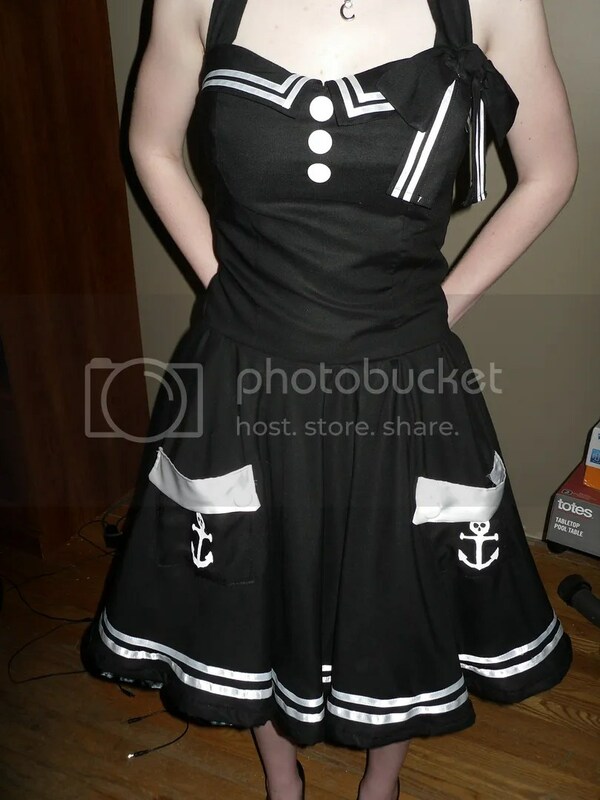 In my previous post A knock off Rockabilly dress I shared how I made a similar looking Hell Bunny dress. To finish the look I needed a petticoat. 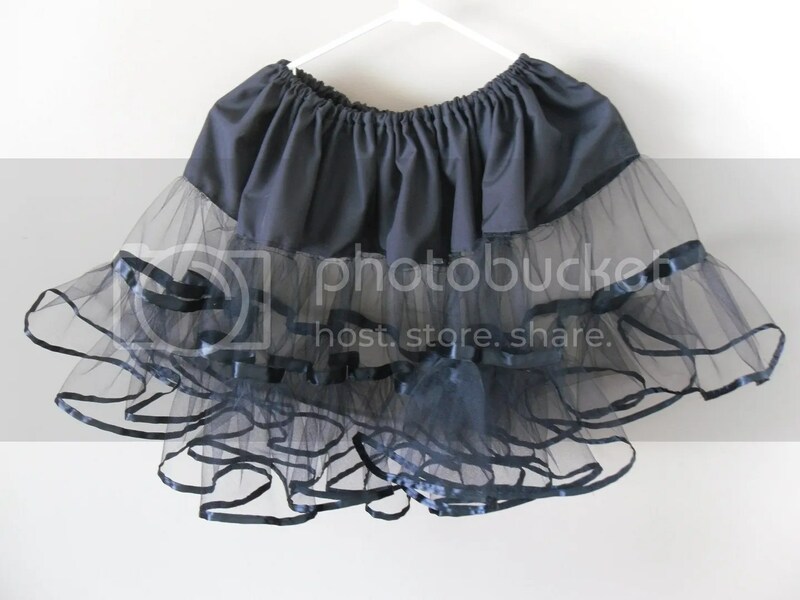 Petticoats can be quite pricey depending on the length and fullness you are looking for. 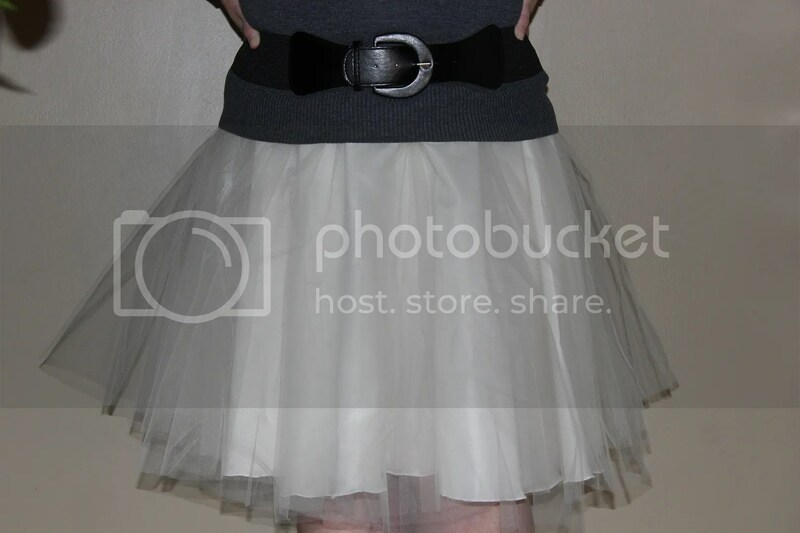 I have come up with an inexpensive simple way to create this petticoat. Yep that’s it! 4 things! 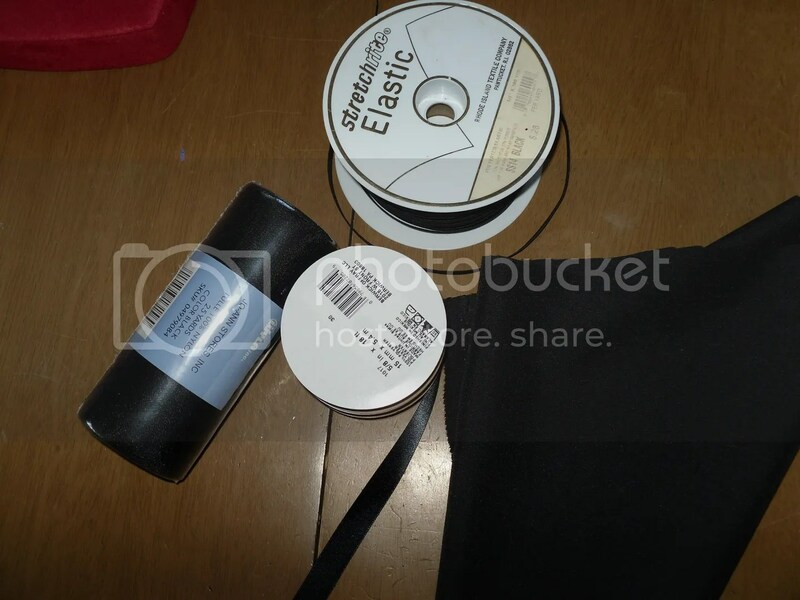 The roll of tulle was $2.99 Ribbon was 1.97 a roll and the elastic was 28¢ a yard. The lining was $1.99 a yard. The lining can be anything from nylon to a cotton blend. Whatever is cheapest for you and won’t irritate the skin. My lining is a cotton blend with some nylon in it. I just grabbed the black bolt in the lining section at my fabric store. There are usually 3 color choices.. white, black, and cream. If you go with Nylon you can find more colors but this is not necessary because only the bottom of the petticoat will be visible. 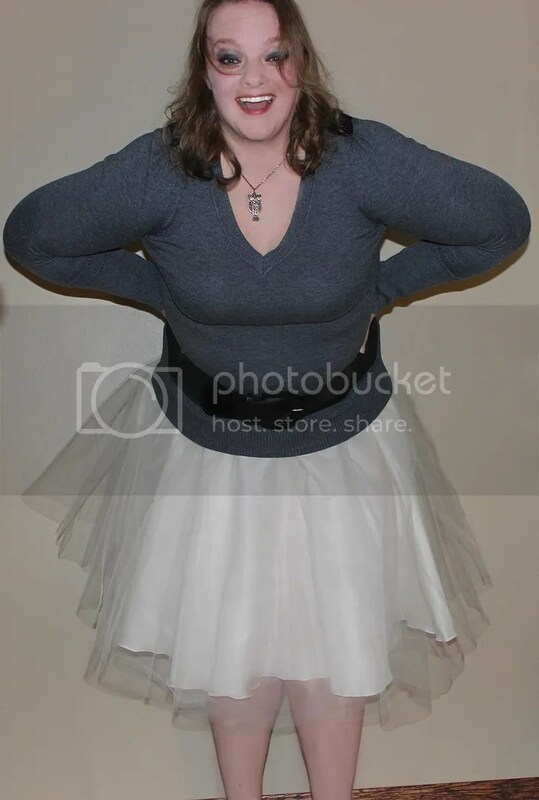 I found the roll of tulle at Joanns in the bridal section. there are several color choices. If you want to make a really bold statement Hobby Lobby carries a variety of tulle rolls ranging from solids to polka dotted to zebra print in many colors. Be frugal and go to their websites to print out or save to your smart phone their coupon! It will save you $$! Don’t be afraid to bring your dress in to the store with you to match up the perfect tulle and ribbon! Trust me the ladies & gentlemen in the fabric department LOVE to see what you are creating and share their ideas and get input on yours! Most of them share your love for sewing and crafting! In the time I worked as a supervisor in a fabric store I have seen everything from pillows, shoes, to motorcycle gas tanks come in! YES a man brought in a gas tank from his custom motorcycle to get some great vinyl to match!! You will need to cut from the tulle one 8 yard piece and one 4 yard piece. Starting with the 8 yard piece fold it in half, set your machine to 1.5 mm stitch and sew the ends together to make a giant tulle circle. fold down the seam to one side and sew over it close to the edge. You don’t have to do this it just makes it look prettier when the seam isn’t sticking out. Follow that step for your 4 and 2 yard pieces. 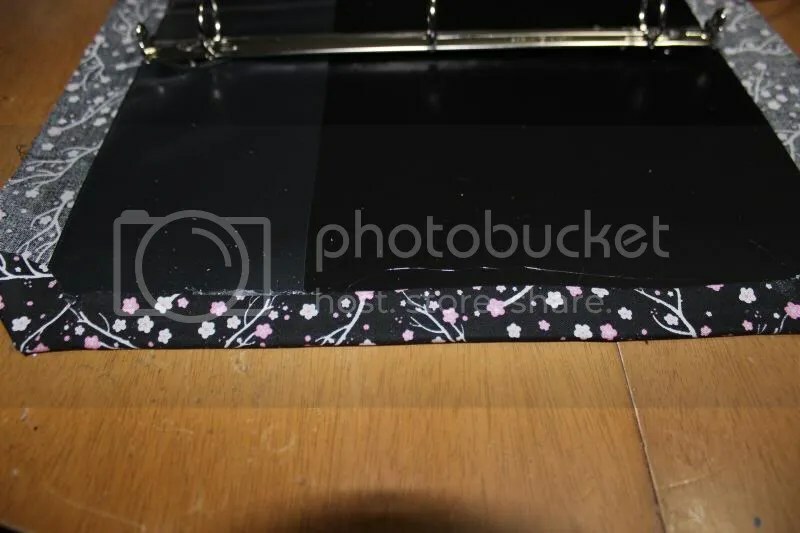 Grab your 8 yard piece and a spool of ribbon, fold the ribbon over the edge of the tulle and sew into place with your length set around 3.5 mm. This gives your petticoat a really polished and finished look! This is a tedious step and the hardest step. But don’t stress over it. once you are done go back and check the ribbon and mark each spot that the thread missed and go back and sew it. No big deal! 🙂 even when pinned I miss a spot or two! When you reach the end of the ribbon grab another spool and to start it fold the end under a bit and do the same when you come to the where you started. Gather the top of the 4 yard layer just like you did for the 8 yard piece. 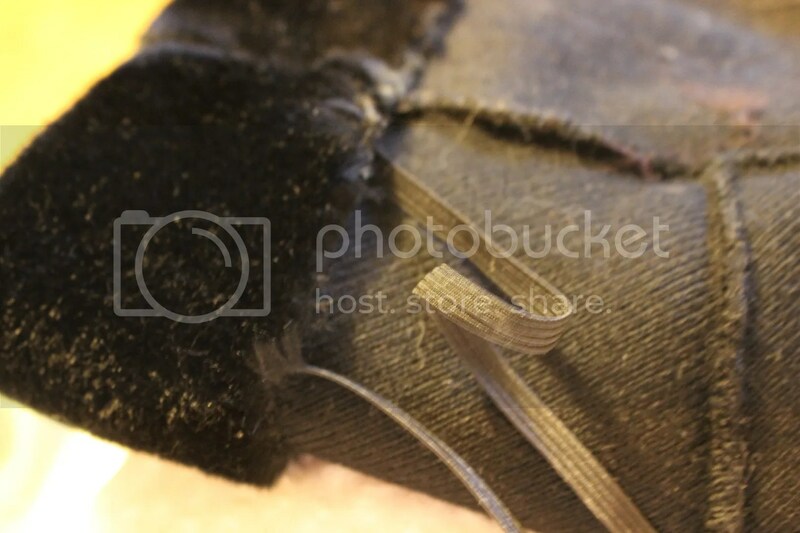 Attach it to the lining piece by sewing it with a 2.5mm stitch. 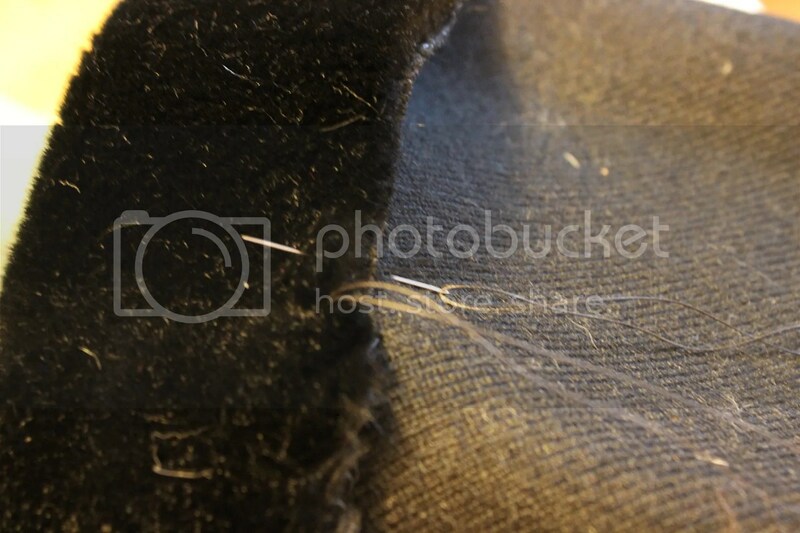 Fold the seam up towards the lining and top stitch around sewing the seam down. Over lock the edge of the lining piece or serge it. fold down ½ inch or so just enough to fit your elastic sew down leaving an opening at the seam to insert the elastic. measure your waist and cut the elastic to fit. Feed the elastic through the top of the petticoat. Sew the ends together with 1/2 inch seam allowance or more depending on how snug you want it. Try it on, if the fit is good sew the opening shut. If not adjust as needed. It just looks so amazing with the ribbon! and when it sticks out of the bottom of the dress slightly it is so adorable! If you would like your petticoat to be even fuller you can simply repeat the steps for the 8 and 4 yard pieces omitting the ribbon between the pieces but making sure you still fold over ribbon on the bottom of the 8 yard piece and you will want to fold the seam up and sew it down between the pieces where you leave off the ribbon. This piece you make will be gathered and attached to the lining piece with the first piece you made but underneath it. So you will have 2 layers of the 8 and 4 yard piece but the top layer will be the one with the ribbon between the 8 and 4 yard piece. If you would like your petticoat to be longer you can do this by making the lining piece wider than 6″ or adding another layer to the bottom making this layer 9-10 yards long. You can also achieve more length by making 2 4 yard pieces and sewing them together before attaching one end to the 8 yard piece. Until next time! Happy Sewing!! This has been a dreadful month with all the upcoming events and holidays not to mention the glitch which has caused a great delay on our tax refund. I have been under tremendous stress which leads to panic attacks. I don’t like taking my meds for it because I’m not a medicine person. I’d much rather find relief a different way. For me, being behind my sewing machine helps! So that is where I have spent a majority of my time this month working on random things. Recently my daughter came to me with a photo of a rockabilly dress she found on google that she must have. I looked into it and the cost was too high for our budget so I decided to try and make the dress myself. So I hit the internet, pinterest and fabric store pattern books to try and put together a dress for her. 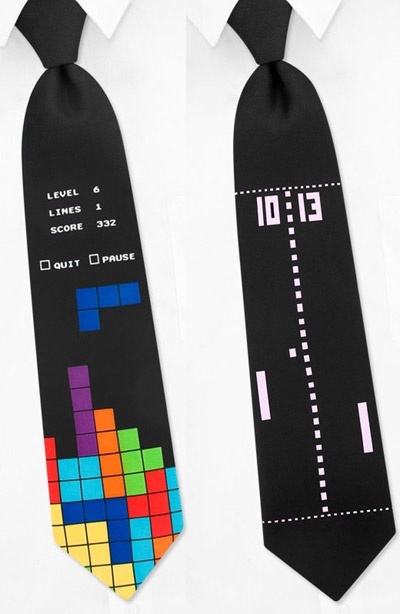 After much debate and consideration I finally found the perfect match ups for the dress. The original dress she found is a Hell Bunny Motley 50’s dress. I am going to share with you the way I made my version of the dress. My version of the dress is quite different from the Hell Bunny dress. For starters the bodice is longer. The band goes all the way around to the back instead of stopping at the sides. The back of the bodice is not smocked, instead the dress is fitted to fit her I also made sure it can be taken out in the waist. The pockets and the collar are not rounded I found it much easier to make them square. And finally because I could not find the embroidered anchor for purchase I hand painted them on the pockets instead. First I came across this awesome tutorial on how to make a simple circle skirt on Burdastyle.com . The pattern can be found here. I used this method to make the bottom of the dress. I did not cut the seams in the skirt. I only cut one seam to allow for the zipper. 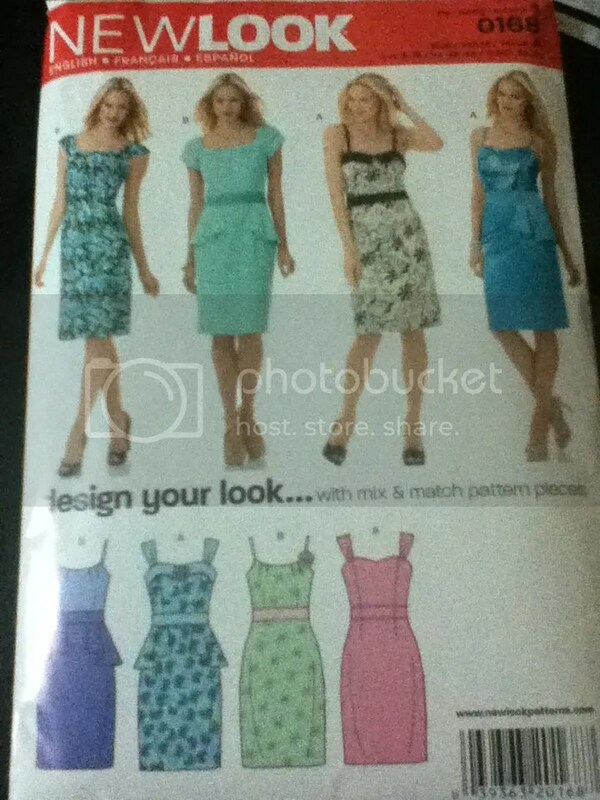 There is a flaw in the directions of this pattern!! When you are making dress A the directions will tell you to baste the straps onto the bodice front, then your next step is the band. DO NOT DO THIS! Although I knew better I had a total brain fart and followed the directions only to have to remove the entire band and straps! 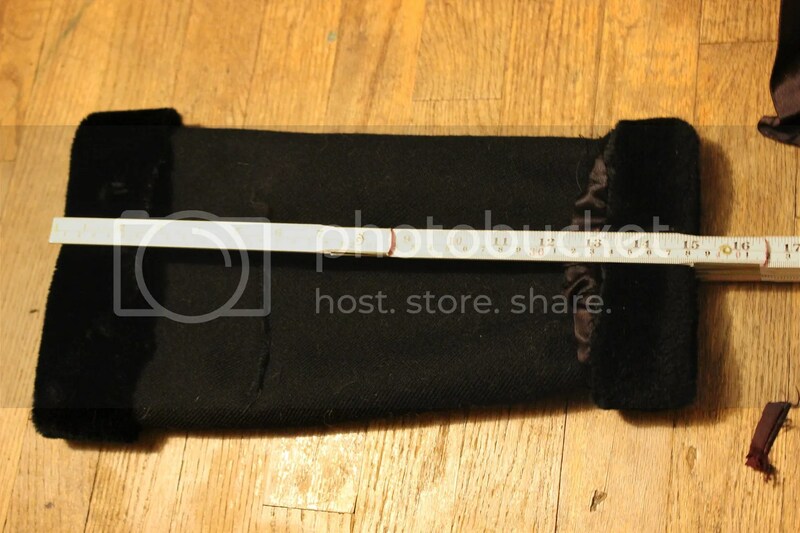 The band must be basted before the straps or the straps will end up under the band flipping it up. I used satin ribbon for the stripes for the collar I used heat n bond to attach the ribbon before sewing it down. I also did not sew the straps to the back of the bodice and I made them longer so they can tie in the back like a halter. Once the bodice was complete I attached it to the skirt. the top of the bodice has a hook and eye and a 14″ zipper that goes down about 4 inches into the skirt. I had my daughter put the dress on for about the 10th time so I could cut the skirt to the length she wanted. I find that it is much easier to use bias tape on the hem of circle skirts. Trying to hem it would have taken me an entire day and it would still be wrinkled, so instead I made bias tape out of the same material I used for the dress and attached it to the bottom hem of the skirt. For the top of the pockets I used some scrap white satin and cut it asymmetrically then just cut a basic square pocket. I hand painted the cute anchor design on the pockets. And finally attached the white satin ribbon to the bottom. My final step was the bow for the top left of the bodice. This was my first time piecing together patterns to create something. I am pretty pleased with how it came out and Caitlin couldn’t be happier!! If you love vintage looks and for a wide variety of amazing dresses and clothes I urge you to check out more awesome designs by Hell Bunny Check out their facebook page by clicking the picture below!